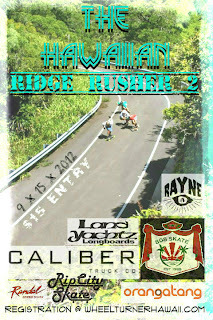 H.W.O.S Event 1 -The Hawaiian Ridge Rusher. Write up and Photos. 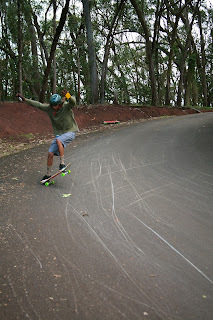 Yesterday, Saturday, September 15th was the first event of 6 events in the 2012 – 2013 Hawaii Winter Outlaw Series and I gotta give it a big CHEEHOO! What a start to the season! We had nearly 50 racers out on the beautiful, sunny, North Shore of Oahu ready to race. 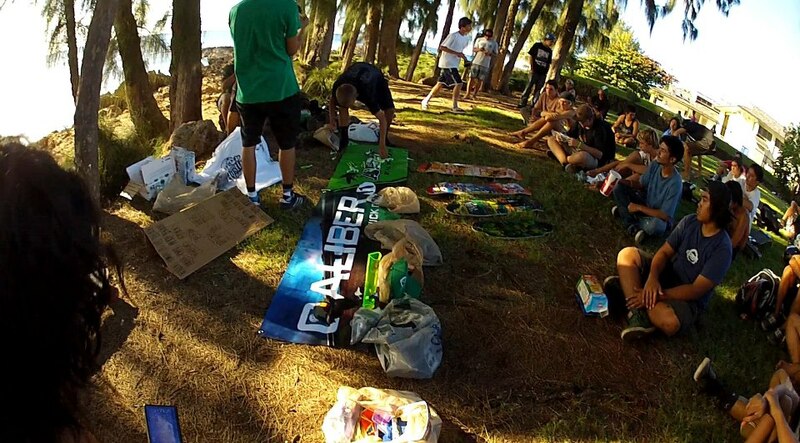 We gathered at the beach on the bottom of the mountain to get registered and get brackets set. Once everyone stocked up on water for the day we decided to head up the mountain. Upon arriving at the top, there was a Hawaii forest police officer just leisurely relaxing in his car at the entrance of the course. 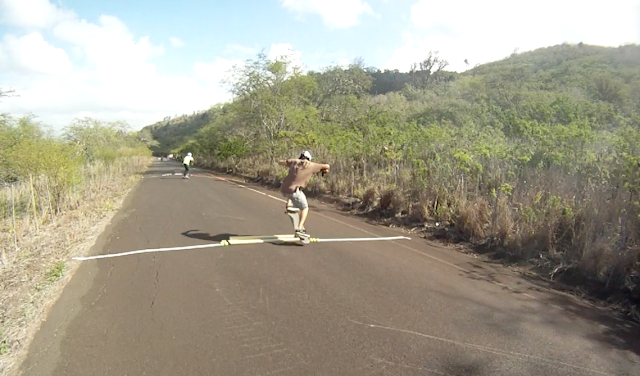 So we instantly signaled all arriving skaters to turn around and head back to the beach. This was a nice little wake up call to remind everyone that this IS an outlaw race, and not everything can be perfect. So we took an hour break, and headed back up the hill. Now he was gone, so we all started our hike into the race course. 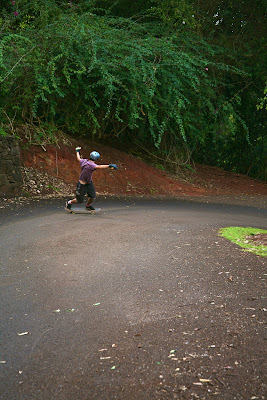 You walk a dirt road for about 15 minutes then out of no where, Butter,flowing curves appear on the tip of a Hawaiian mountain ridge… to top it off, its closed to cars! When finally getting to the race course, there was a BIG puddle and some mud across the road. BUT our downhill community grabbed shovels and booms and made it nearly perfect in minutes. So practice runs got underway. After everyone was looking comfortable on the course, we got underway with the first, prelim round. Several riders were seated in the next round to even out the bracket, so this round determined who would make it into the main event. Just because this was only the first round, there was no shortage of shreddage. 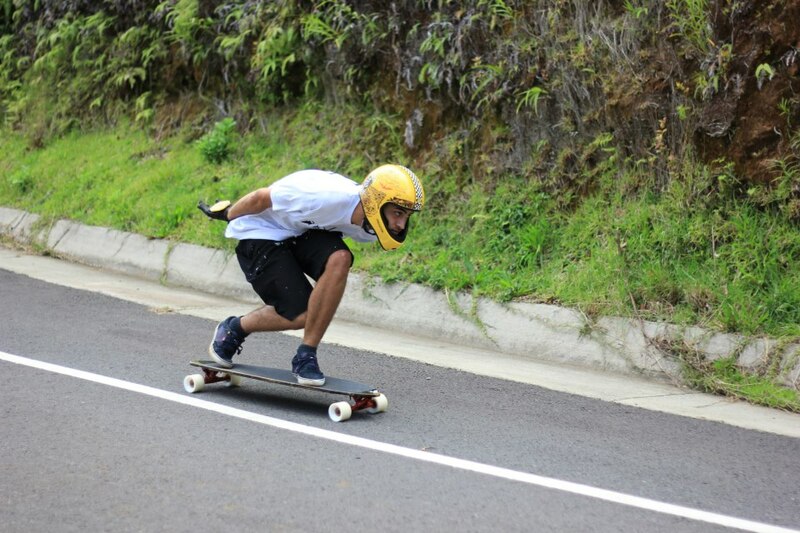 Fast starts ( pushes and throw downs ), tight packs and intense passes were all seen from the very first heat! After 8 heats of battling it out, the top 2 racers from every round moved on up to the top 32 bracket. 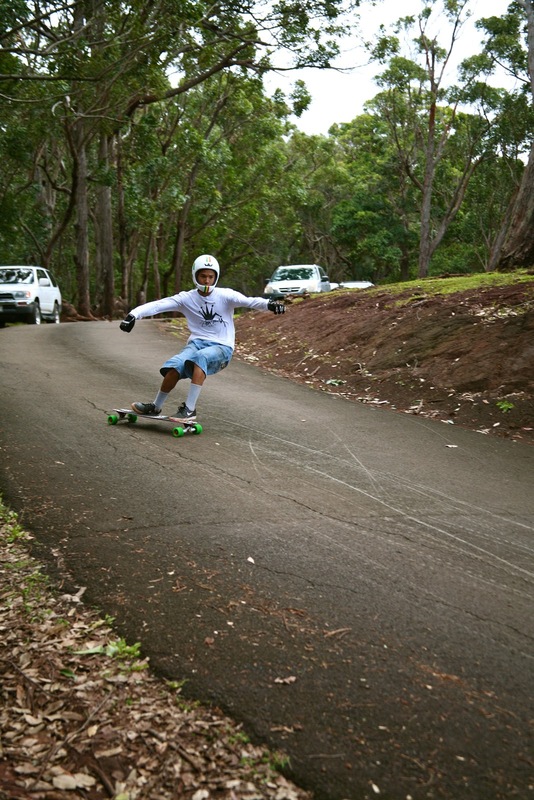 With this course being fairly mellow, no drifts, just tuck, go and find the right line… these next few rounds got HEAVY. Everyone had their game face on, all riders on point, fighting to make it across the finish in 1stor 2nd. 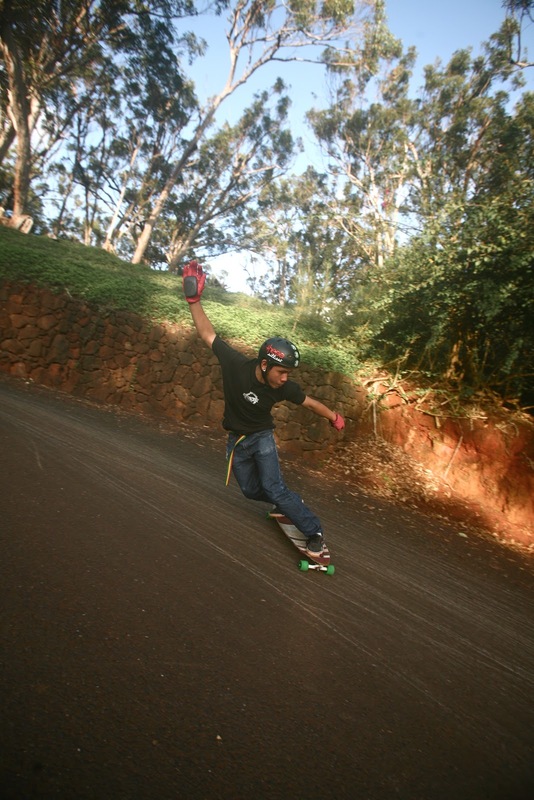 As the battle continued on, the top 2 moved up once again… giving us out top 16 racers. Now the brackets are full of some of Hawaii’s best downhill skateboarders, including Sector 9’s Ethan Lau, last years event winner Nikko Kamanuwai, H.W.O.S x2 overall winner Mackenzie Yoshida to name a few. Nothing but tight, top notch, Hawaiian racing this round. Every heat staying in one pack, nearly connected from start to finish… going for the winning lines. These heats were getting so close we needed to start sending riders to the finish just to watch CLOSLEY to see who came across that line first. As the battle moved on, it came down to our top 8, the semi finals. 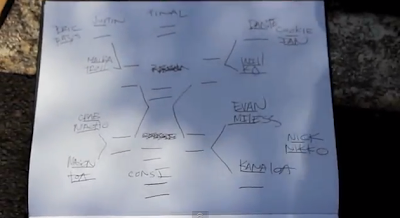 Making it was Nikko vs Maika vs Ethan vs Will and Cookie vs Keola vs Rhys vs Mackenzie. In the first semi final, the racing was tight! 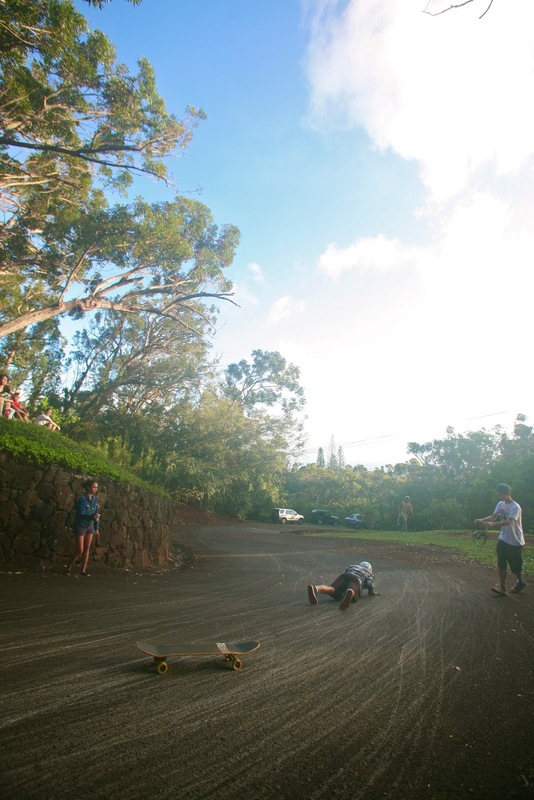 So tight that they needed a redo between Maika, Nikko and Ethan just to see who would move on. And in the redo Nikko and Ethan held on strong making the finals for their 2nd year in a row. 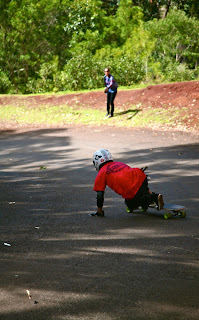 In the second semi, Rhys kept a good lead in front as the other 3 fought for second… Keola ending up in the number 2 spot! 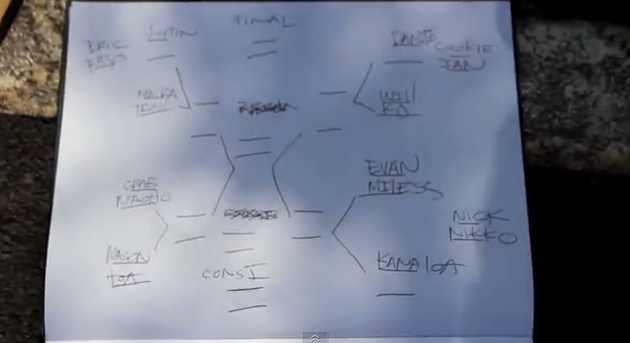 The finals are Nikko, Ethan, Rhys, Keola and the semis are Cookie, Mackenzie, Will and Maika. In the consi finals, all racers were in a line dropping into the first dip Maika leading the pack. 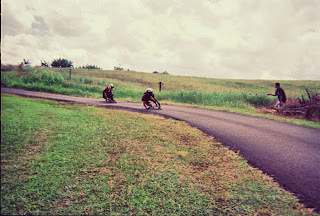 Mackenzie, cookie and Will closely following, tucking, drafting and bumping their way to the finish. In the finals, all riders stayed close. 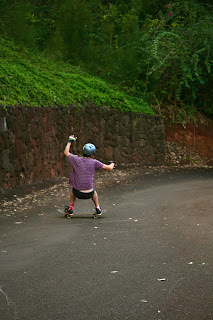 Every rider in a perfect tuck, not budging a bit. 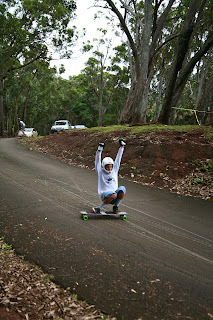 As they round the last corner, making it across the finish line first, for the SECOND year in a row was NIKKO Kamanuwai! Following the finals we all headed down to the beach for the awards. Riders were treated with a load of boards, trucks, gloves, wheels, refreshments and a Hawaiian sun setting into the Pacific Ocean. All the skaters who came out left with smiles and stoke. It was a full day of wheel turning and positive vibes. 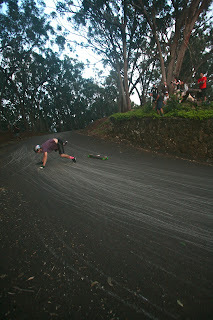 That’s what the Hawaii Winter Outlaw Series is all about! 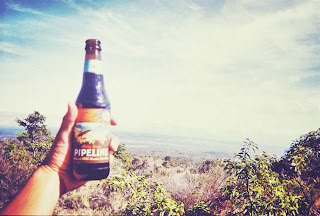 Big Island’s next… who’s ready?!? And the rest of those who supported us! 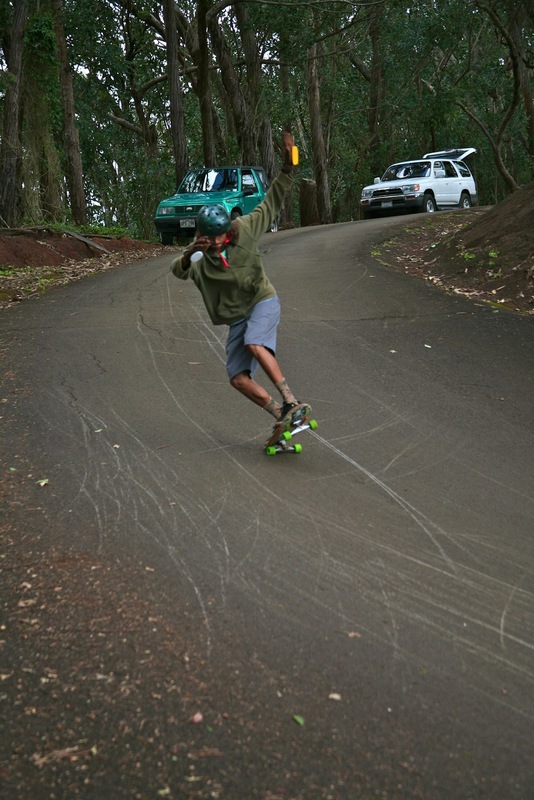 HawaiiWinterOutlawSeries event 2 - The Big Island Adventure. Write Up and Results. Gnar bombing, epikal parks, waterfalls, volcano’s, crip food, good crew, great vibes … Hilo, Hawaii is where it went down. 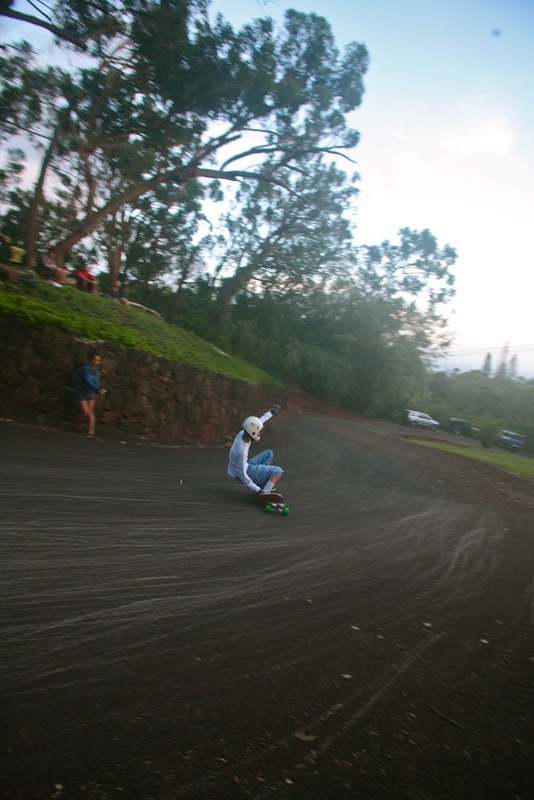 On October 20 – 21st wheel turners from all over the state gathered on the Big Island of Hawaii for the 2nd event of the Hawaii Winter Outlaw Series. 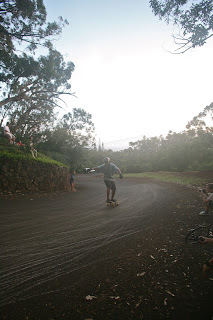 This was our first event on the Big Island, but thanks to the help of B.I local Brian McOuat… boy was it a good one! Over twenty riders gathered at Hilo’s Oasis skate shop early Saturday morning to register and get briefed on how the day would go down. 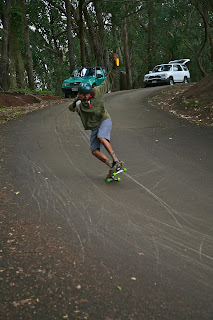 We had 10+ racers from both Oahu and the Big Island. It was great to see the crews united to vibe the winds together! Once the plan was set, the parade of skate mobiles headed down the country road out towards the race course. 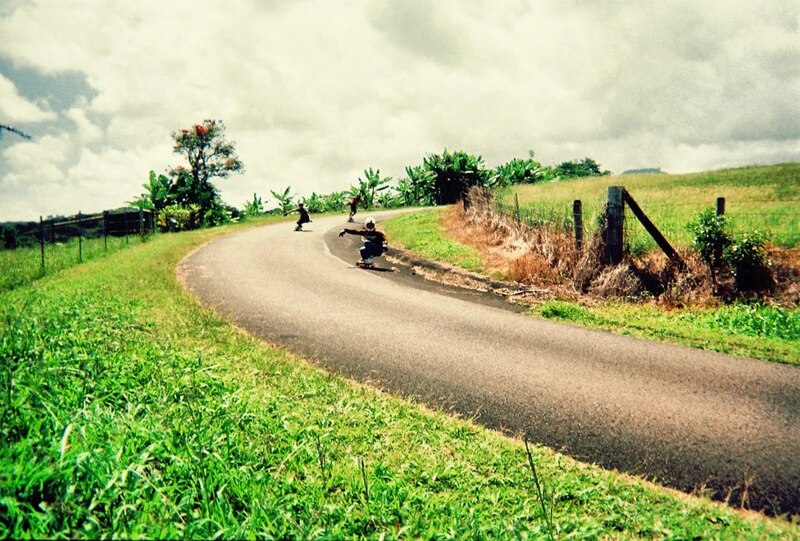 When getting to the top of the hill, all riders had the same thoughts of the hill… it’s a FAST one. 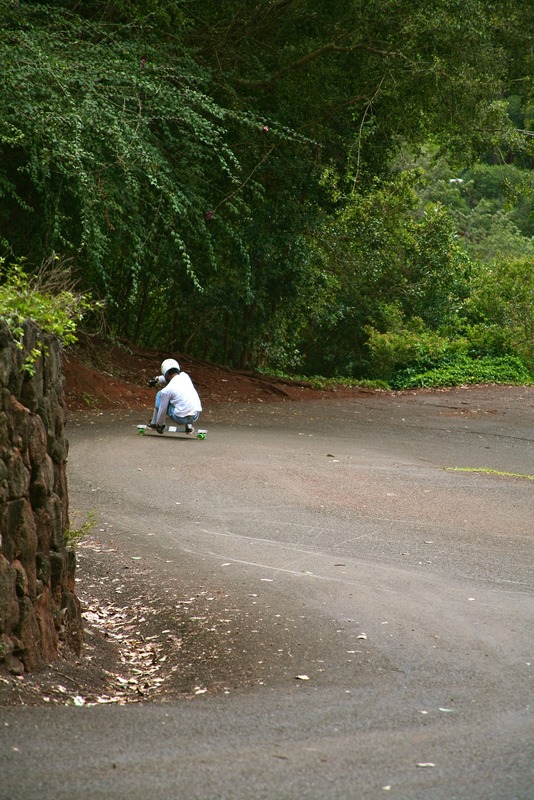 Steep, wide, big sweepers… a tuck and go type of road where you can hit around 50mph. 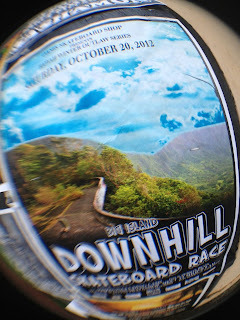 Everyone started to gear up and get the pre race jitters out when… dun dun dunnnnn, an upset Ha’ole resident stopped by us to inform us that she had called the Police on us. So we took off down the hill for a sample run, then bailed. 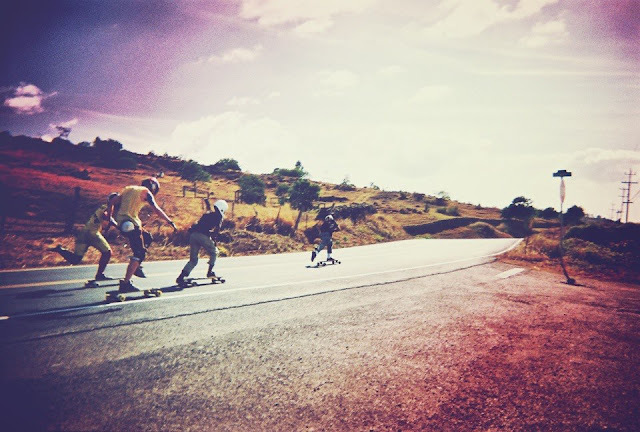 The skate parade headed back down the country roads en route to the back up course. 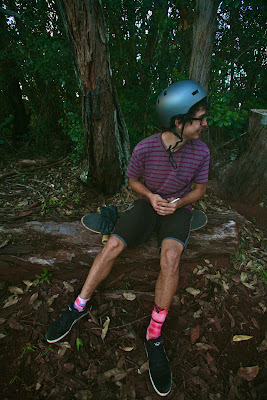 When arriving to the course, the vibes here were much more mellow and relaxed. And the course was AWESOME! 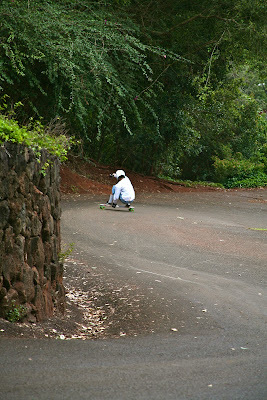 Like the last road this course took little to no drifts, but the TECH o meter went up for sure. 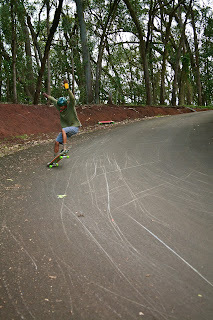 This course was one lane wide, a lot more turney, and fast! You are constantly on the edge of grip, and to top it off… there are little speed bump/ launch ramp things in crucial spots! Riders all agreed that the course needed to be shut down due to the narrowness. So the Big Island boys got on it, and we got ready to race! Now that we are on a different course, the heats dropped down to 1 vs 1 heats instead of 4 man. Everyone paired up for their first heat and H.W.O.S event 2 got underway! The first few heats took off fully tucking from the start of the course, riding close to utilize full draft potential. Heats were intense! Though the course is narrow, it proved to have multiple passing spots due to how technical it was. Perfect lines and exit speeds were the way to the win. We were underway with round 1, all heats on the course in intervals, when somehow there was a break in communication and 4 cars were let onto the course. 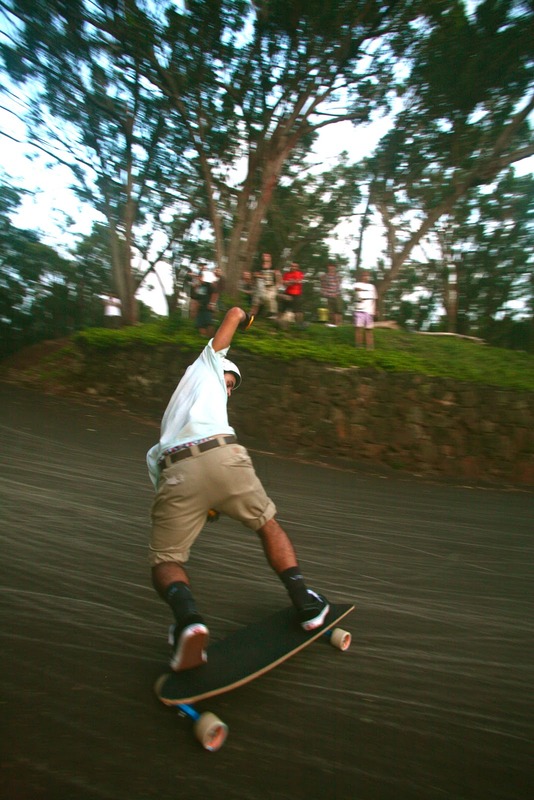 GNARLY! 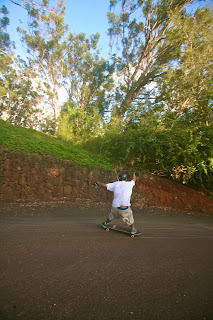 Some Oahu style skating went down! 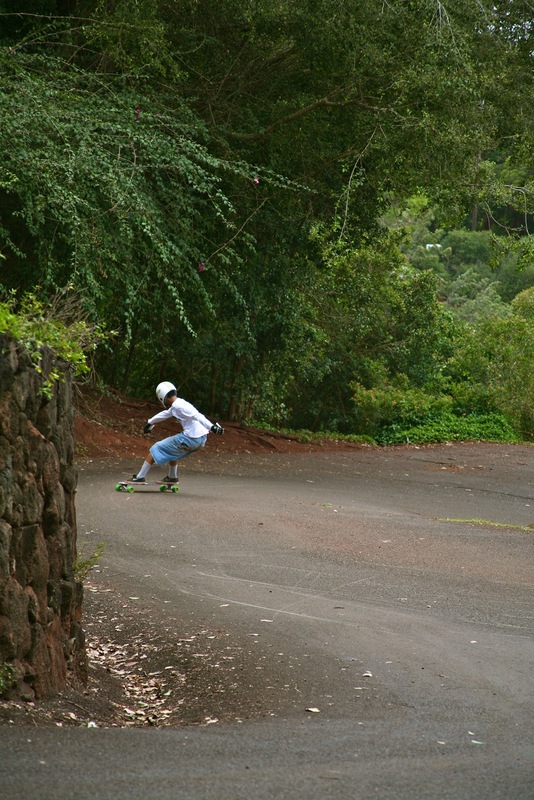 Heats were forced to dodge cars in all directions resulting in many skaters exploding the bushes on the side of the road. 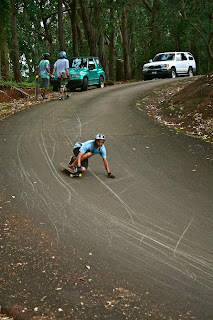 Luckily everyone got out of the gnarliness ok, with only a few minor road burns to be had. 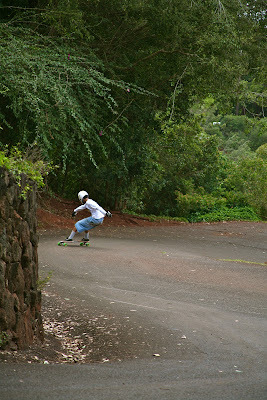 Skaters regrouped to head back up the hill. 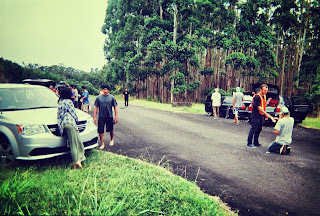 This time we needed the road GAURENTEED shut down, so we took a few minutes to situate cones and cars. 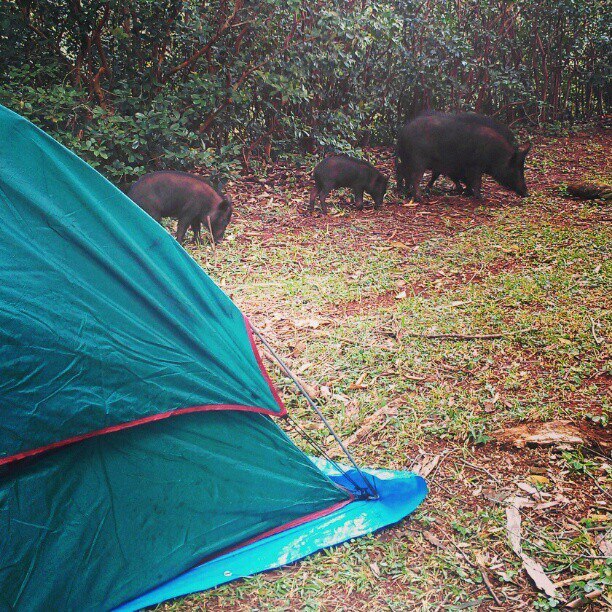 Then BOOM, the Hilo rains hit. Good thing we had a back up day scheduled! 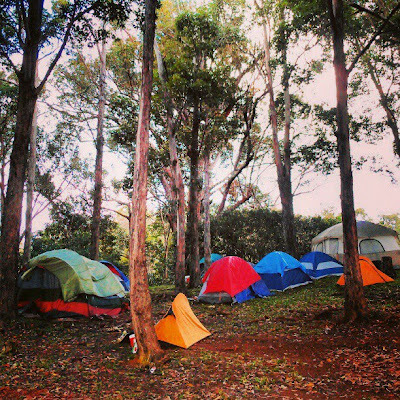 Everyone packed up and headed down the hill to the BEAUTIFUL camp site. 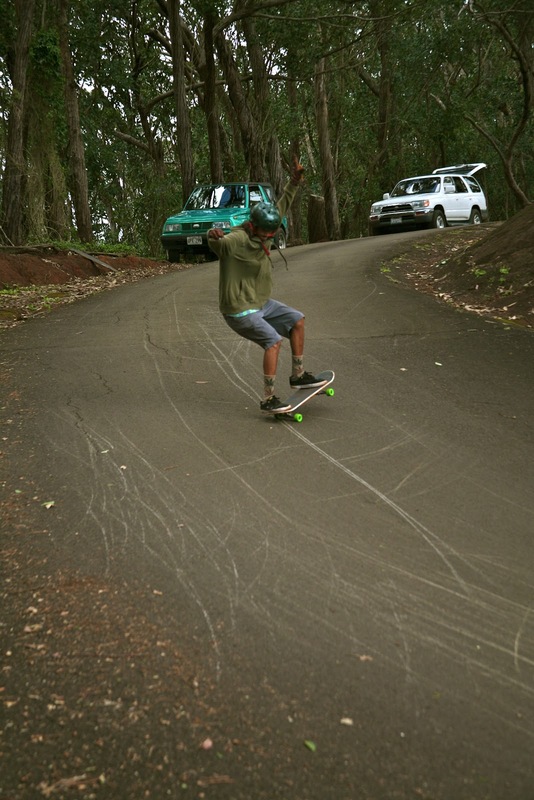 We were blessed to stay at a beach park at the bottom of the course… and this zone was as prime as it gets. Ocean front. 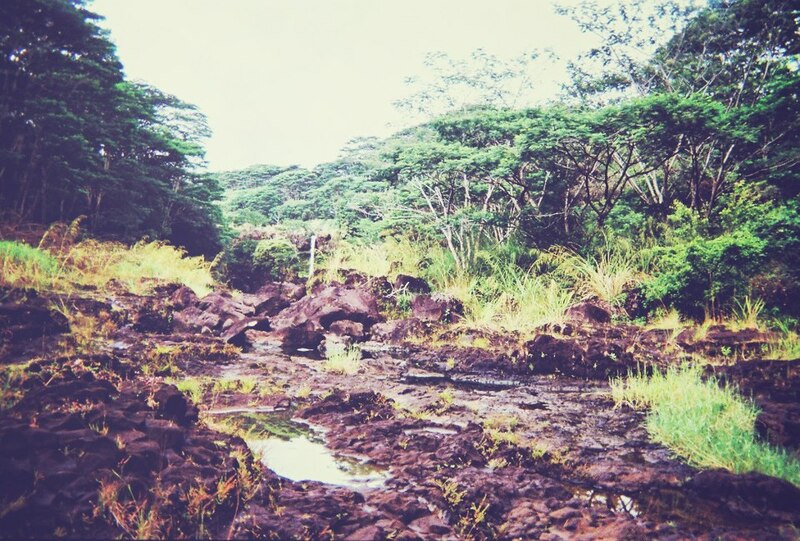 A waterfall ending in a stream, which leads to the ocean. Rope swing. Bathrooms. Electric Outlets. Hawaiian Lush Jungle Goodness. Not a bad way to sit back and relax for the rest of the day. Day two we woke up on the beach to epic weather. 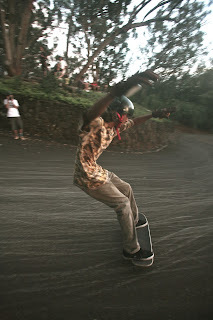 Skaters were amped! We got briefed on how the day would go, and everyone headed back up the race course. After the issues we had in the previous day, we came prepared on day two to shut this road down! 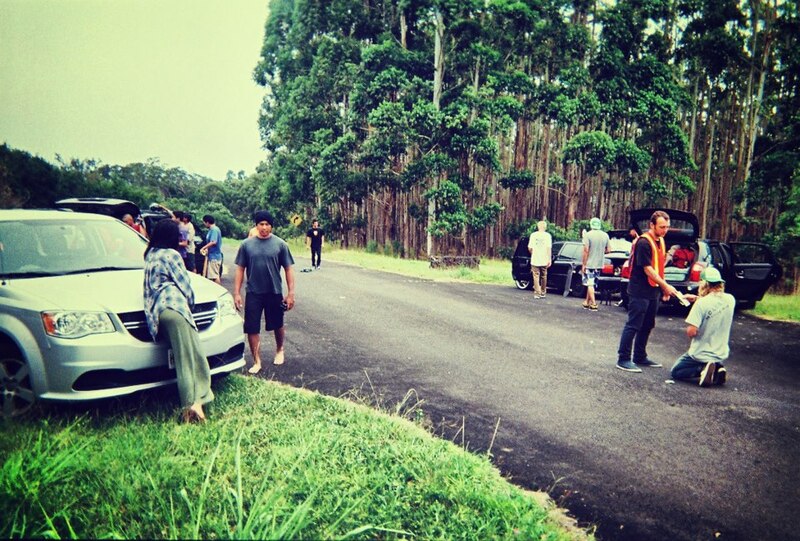 Cones, multiple cars, human chains… you know, the necessities. We went up the hill and redid any heats from round 1 that may have been interrupted by machines. Once that was settled we were into round 2, and half of the riders pool was cut in half. HEATS WERE STACKED! Seeing rounds such as Nikko K vs Rhys M , Ethan L vs Mackenzie Y and Ben F vs Datne A. Now that all riders are comfy on a closed course with several runs under our belts… the heats were even heavier. In this round you could see many different strategies come into play. Some with the strong push and stay in front, others with the sandbag approach or some who just went for the passes in the most hectic sections. It all made for some top notch racing. 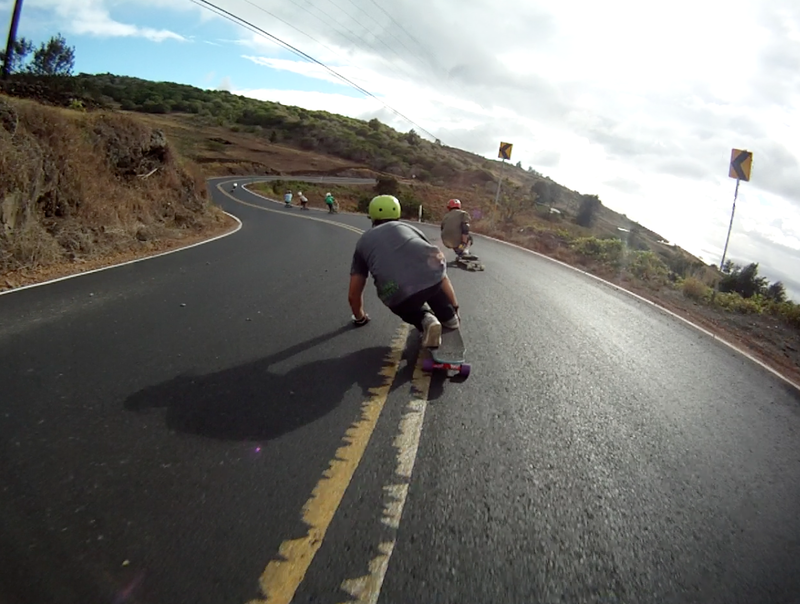 We opened up the road in between rounds to allow traffic to go by. All residents on this hill were full of loving vibes. 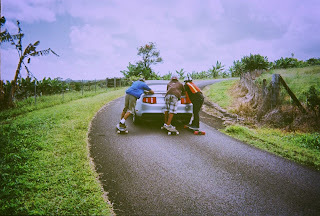 They were all stoked to see what we were doing and we wanted to do it safely. I LOVE IT! Next round is the quarter finals, the top 6. Now in order to make the final rounds even, racers would have to skate a 3 man heat, eliminating 1 rider per heat to get us our final 4 for the semi finals. The heats were Brian M, Ethan L and Dante A in heat 1. Erik S, Dusty O and Rhys M in heat 2. Heat 1 was insane! 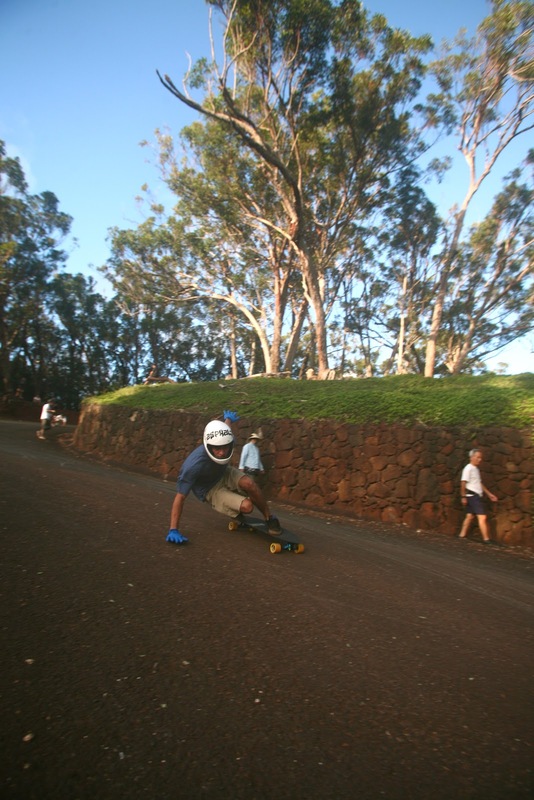 Brian kicking into first, then Ethan and Dante closely following. 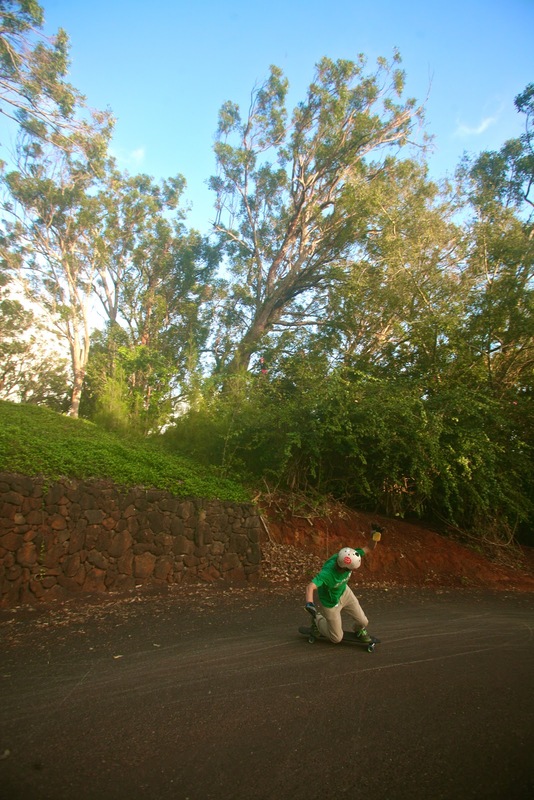 In the top of the course, Brian held his lead as the two stayed in his draft bubble. 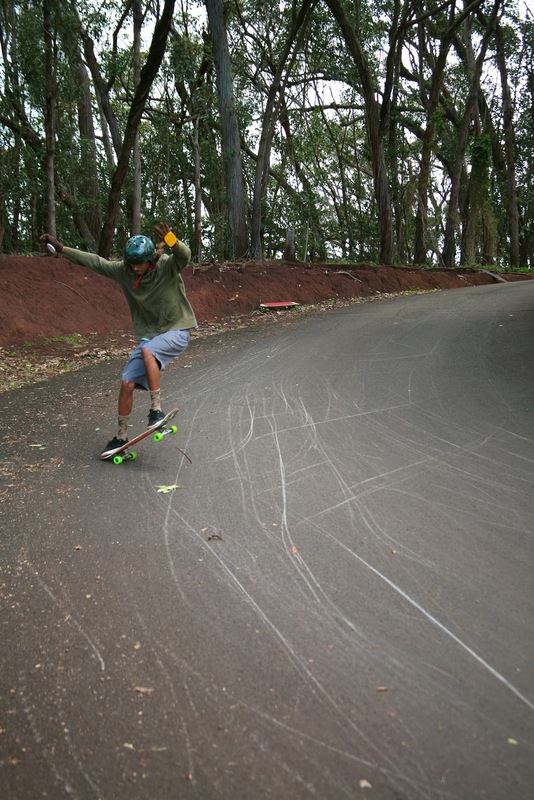 As the riders went through a few corners into the “speed section”, Dante started to make his move drafting from 3rd to 1st right before the gnarliest double apex left, speedbump ,to right S turn. 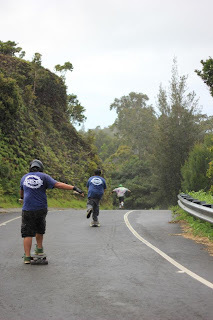 The skaters were 3 deep going into the right when Big Island boy Brian just couldn’t hold his line, sliding out, leaving Dante and Ethan to finish top 2. The next heat with Erik, Dusty and Rhys was equally as intense. 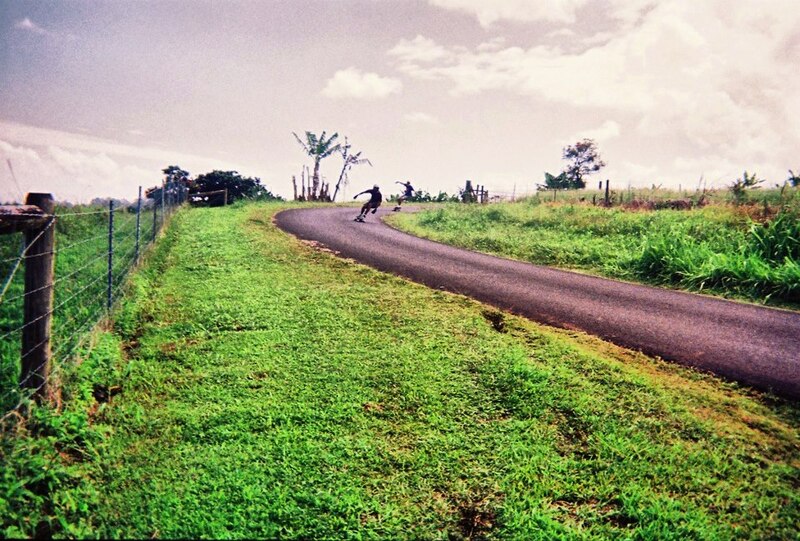 All riders switching positions at the top of the hill several times before coming into infamous speed bump S turn. Once again riders were charging 3 deep, forcing Dusty off of the road leaving Rhys and Erik to take off towards the finish for 1st and 2nd. We now have our final 4 riders, and it looks like Oahu has claimed the podium spots. The Semi’s are Ethan L vs Dante A and Rhys M vs Erik S.
Rhys and Erik’s heat was first to race. Both of these guys are ninjas with perfect tucks. Erik decided to pull a little sandbag action, so at the start Rhys gave it a second push to secure his gap. From here on out it was Erik chasing down Rhys, but Rhys was able to hold his lead and move onto the finals. Ethan and Dante went next. Ethan had the lead off the push and through the whole top section. Dante was in his wind bubble the whole time but held off till right after the S to make his move. Shortly after the turn, Dante went for the draft and pass. This left Ethan only a couple turns to catch back up, but he couldn’t do it in time, moving Dante into the finals! 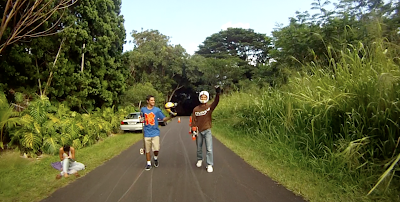 We let more auntys and unko’s drive through the course as we set up the final round. All residents were still stoked! Now, its time for the Finals. 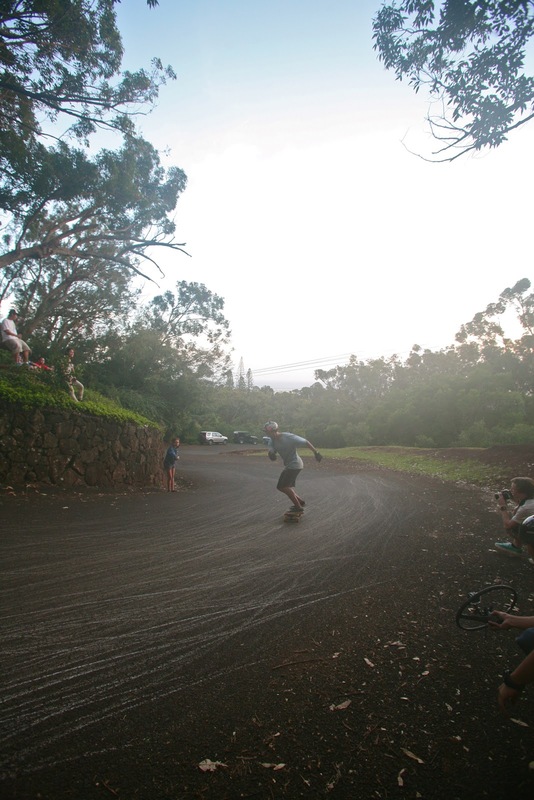 First up was the race for 5th and 6th between two Big Island boys, Brian M and Dusty O. Their heat was close. 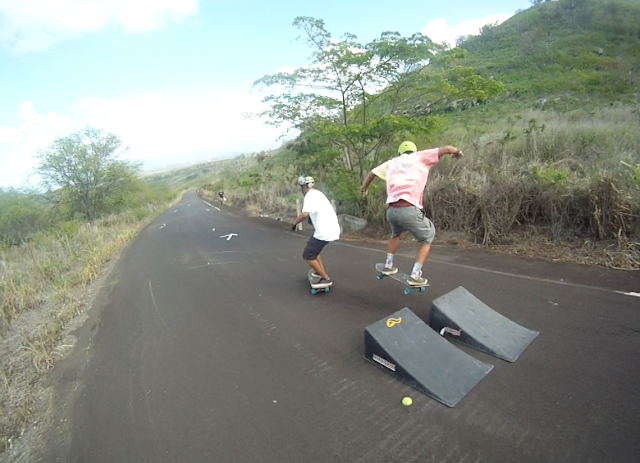 Both of these guys are locals on this road and know it like the back of their hand. 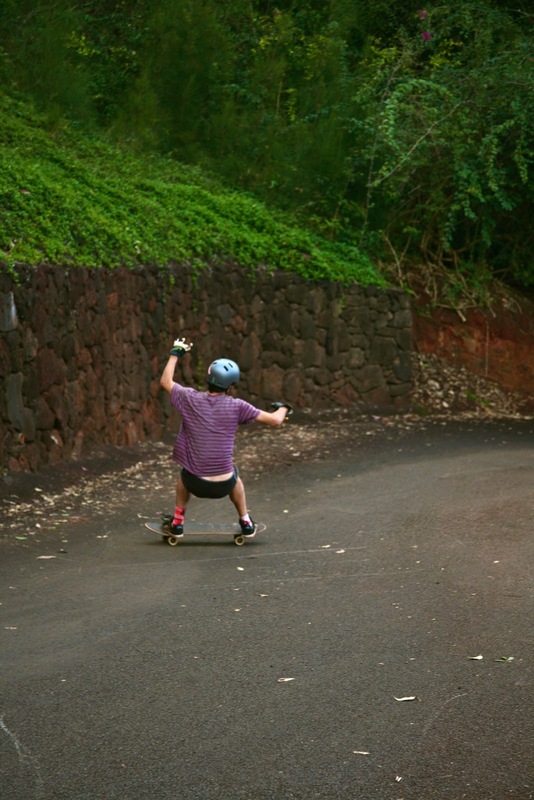 Midway down the course, Brian goes for the pass in the “speed section” and Dusty takes a crash as soon as Brian makes the swoop. Leaving Brian alone for the rest of the course finishing up in 5th place. Next up is the battle for 3rd and 4thbetween Ethan and Erik. This heat was GREAT to watch. Both riders started the heat barley kicking, almost wanting to be in the back. Once they began to tuck Ethan held his spot in front for a little. Erik would catch him every once and a while, but then stand up and hold back. Both riders went into the S fast and clean, and this is where I expected Erik to make the move, yet he still held back. When they were entering the second to the last corner is when Erik finally decided to make his move, Zooming by Lau and holding the front position till the finish line. Erik finishing in 3rd and Ethan closely behind in 4th. FINALS. Rhys Morishima vs Dante Alston. Both from Oahu, both Tantalus boys… it was ON. 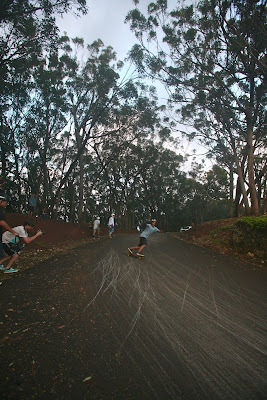 Everyone chose their viewing spot along the hill for this last round, then we got it started. 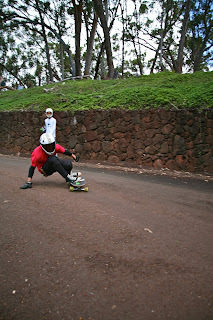 Dante chose to throw down at the start and Rhys gave it a push. 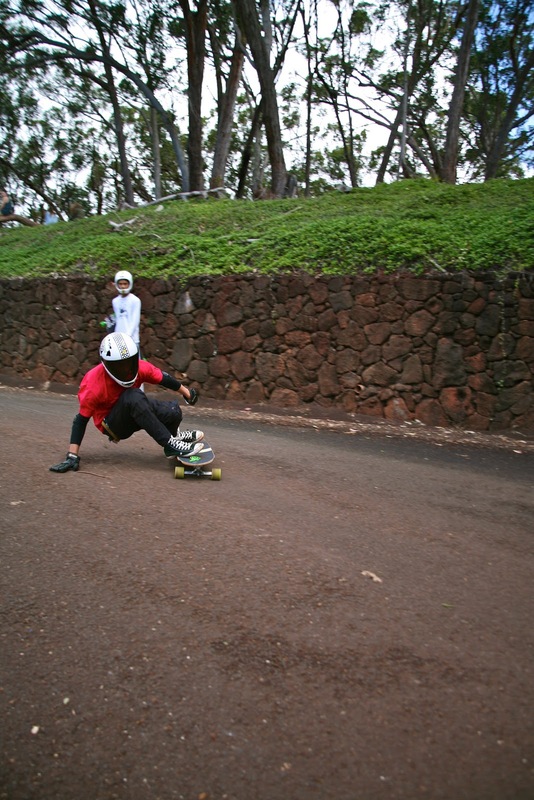 Dante in first, Rhys in his draft going into the first bend. Both riders held their tucks, not moving a muscle in the first few corners. 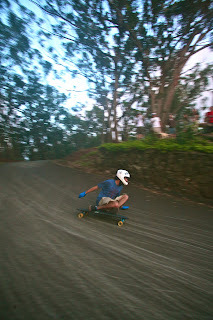 As the riders came into the flat before the “ speed section” Rhys started to close the gap even more, getting right into the pocket as they went into the quick sweeper left before the dip. Right when Rhys was in the perfect sling shot position, he caught a quick wob and it was all over from here! 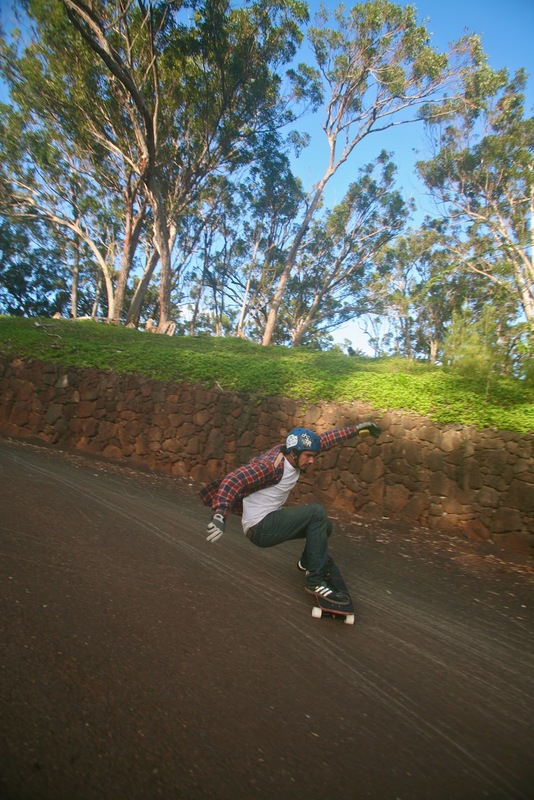 Barley loosing traction for a second sent Rhys into a shake forcing him to eject and sprawl out across the road. 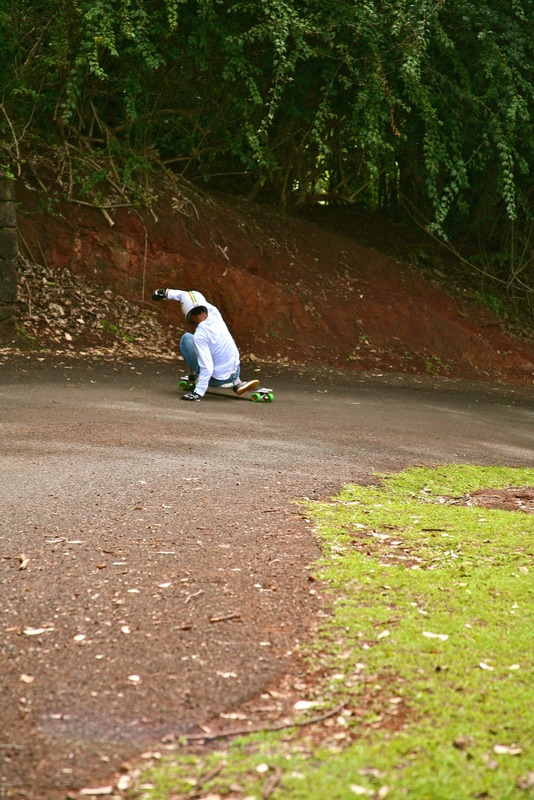 His board even decided to bail into near by coffee fields. 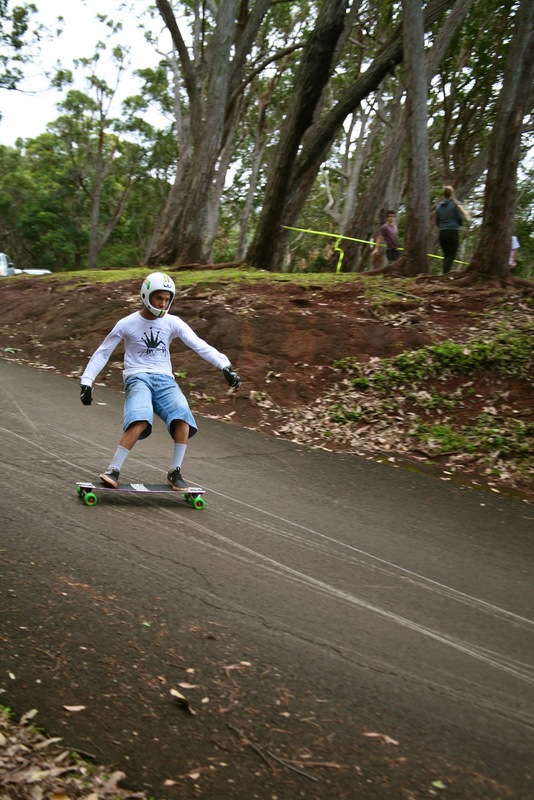 Now Dante kept it together and steezed it out for the remainder of the run, coming across the finish as 1st place in the fist ever HWOS on the Big Island! 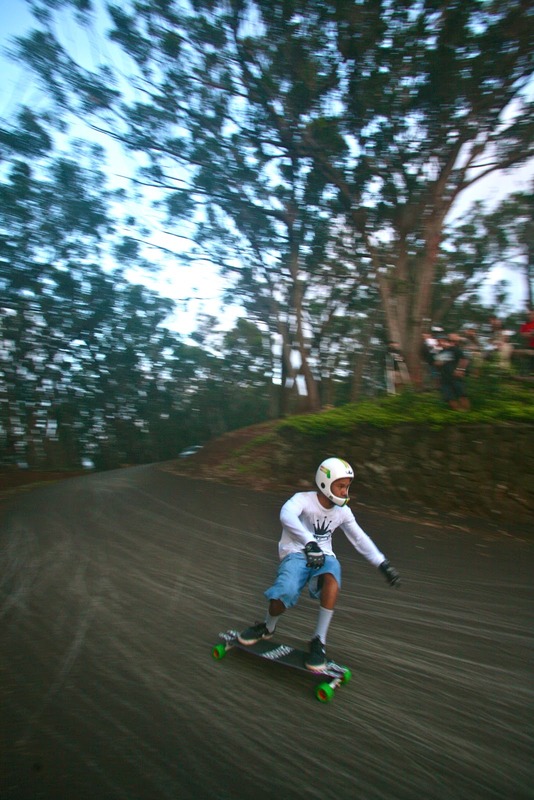 Following the race there was a little slide jam on the hill before the awards… the vibes were just way too good we needed to keep em going! 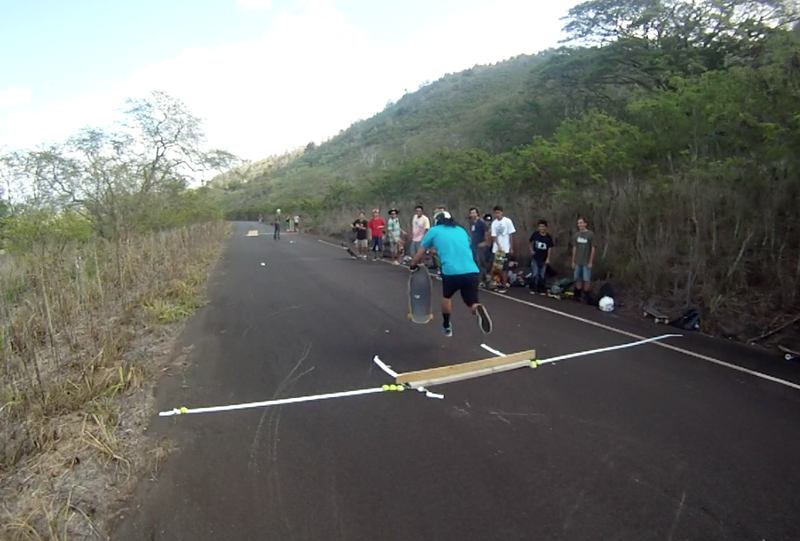 The jam was rad, with skaters from different islands we saw all kinds of styles! 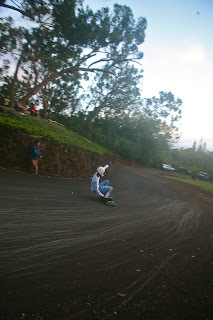 Taking the win for the longest slide was Mike Broan from the Big Island with a BIGG ole front side. 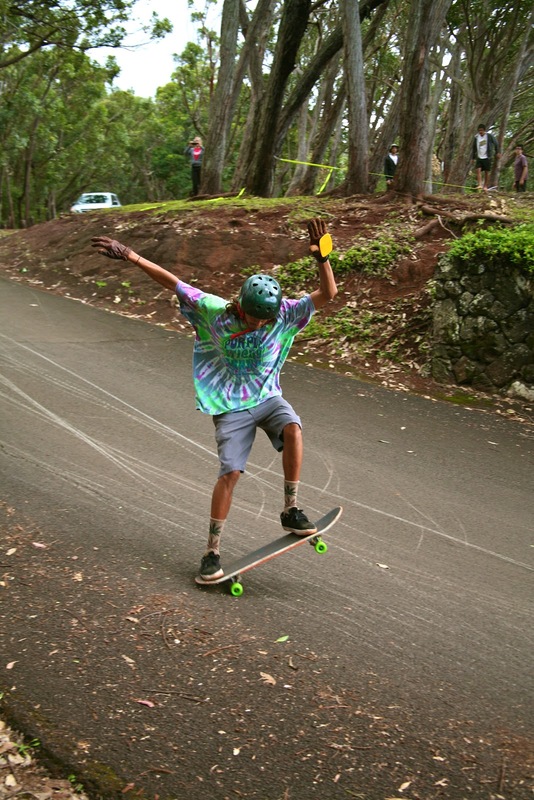 Mackenzie Yoshida took the prize for Best Trick doing a Front side Wiggleply ( wiggle to no comply) and Jeffery Khau swooped the best overall in the slide jam. All skating is completed, everyone is exhausted, so we headed back to the camp for some awards. Thanks to the sponsors almost every participant left with something. 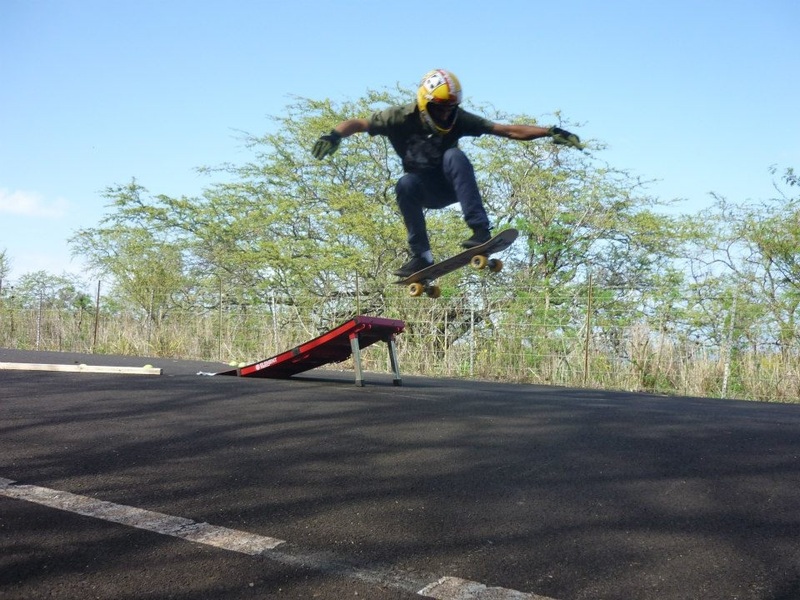 The top 4 riders getting cash and leaving with complete setups! Schwag Gallore. 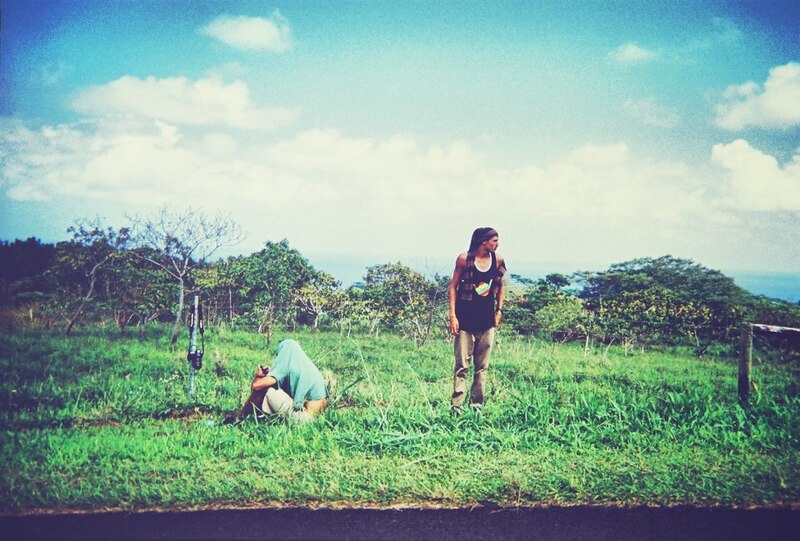 The Big Island was EPIC. Another great addition to Hawaii’s best race series! 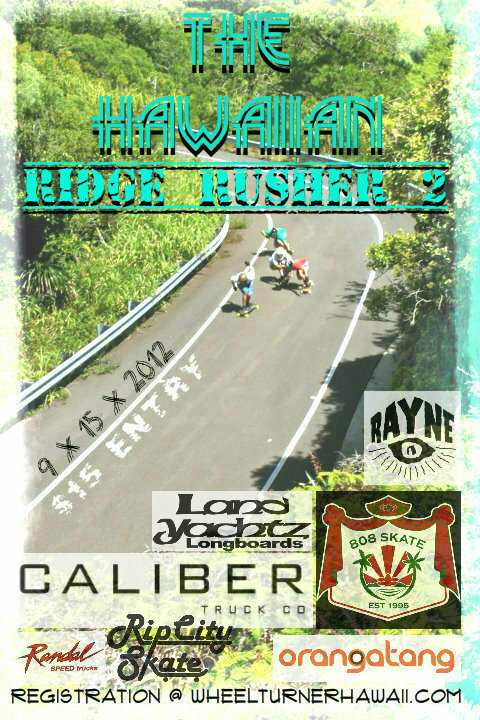 The Hawaii Winter Outlaw Series couldn’t be more stoked to have another island as a part of its festivities. Uniting the wheel turners of the Hawaiian island’s is my ultimate goal… and we all full tucking towards succeeding at this! 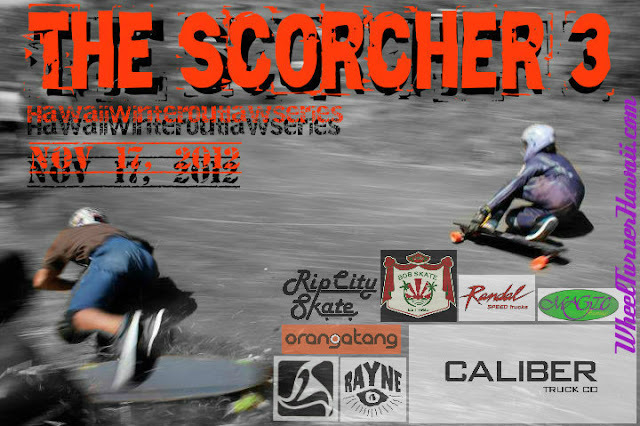 See everyone at H.W.O.S #3 THE SCORCHER. and the rest of out great supporters! 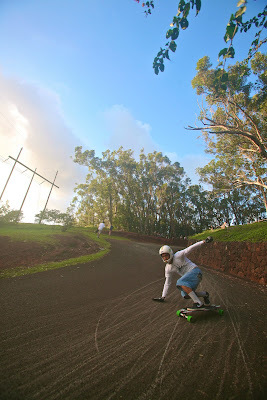 Hawaii Winter Outlaw Series event 4 - The Maui Challenge 2. Write up, Photos and Video. The holiday season has rolled around, so we decided to treat ourselves by hosting the Hawaii Winter Outlaw Series event 4 at one of the best skate destinations in the world… Maui, Hawaii. This island is blessed with the best EVERYTHING. 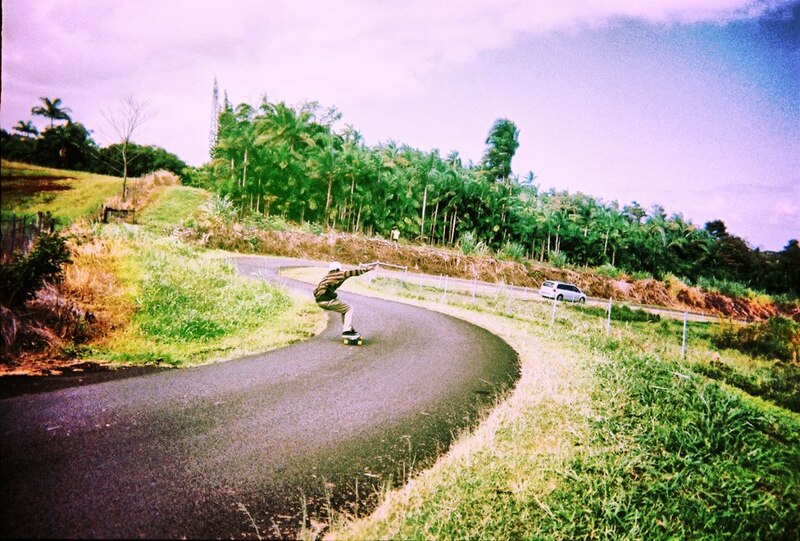 The plants, waterfalls, mountains, roads, ditches, fruits, skate parks … once you experience them, you will never stop dreaming of it. 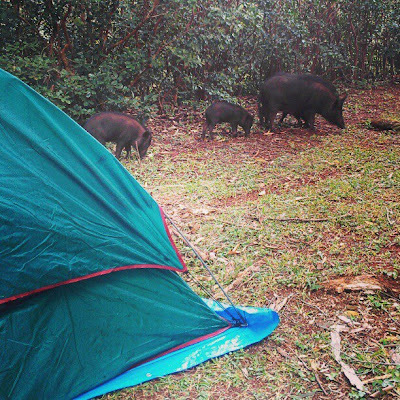 We are stoked the HWOS had a chance to experience it for a second year straight. 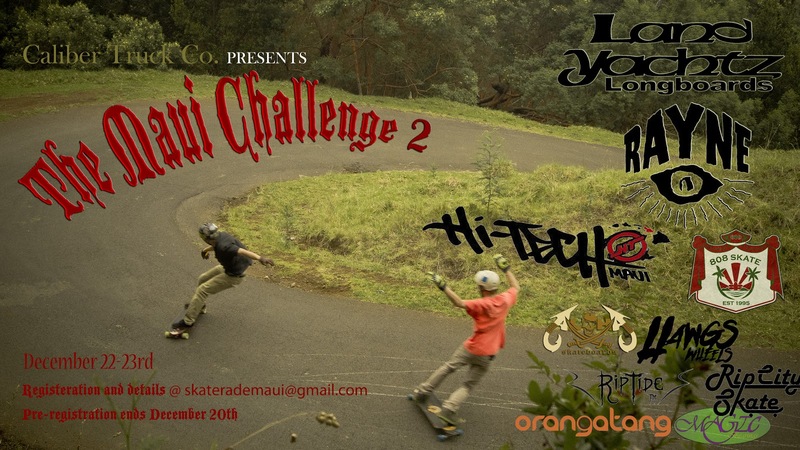 The Maui Challenge 2 was like a joined Hawaiian island skateboarding festival for a week straight, though the event was only 2 days. Clans from Oahu, Big Island, Cali, East Coast and Maui started to gravitate to the mountain a few days before the event. 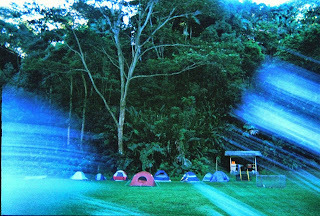 Naturally they all set up camp on one of the BEST hills in the WORLD ( right next to a dropping left hairpin) and got to exploring. 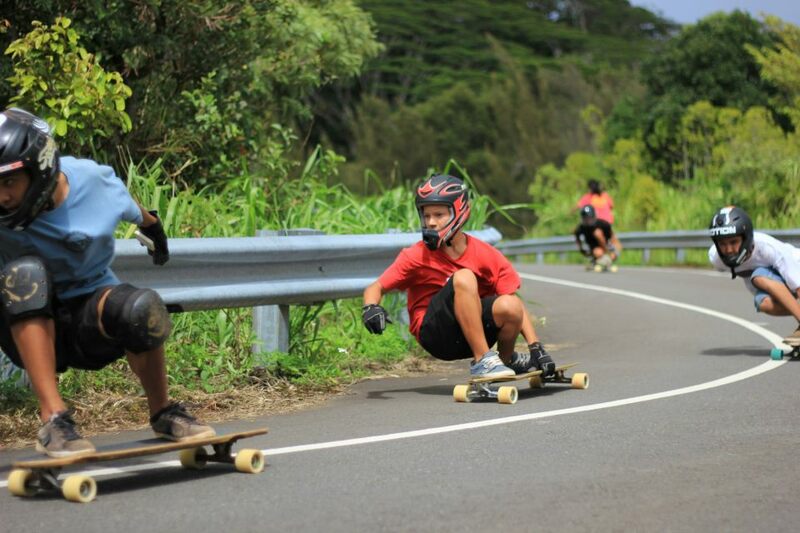 After all kinds of adventures the crews had been through the first few days, the weekend was here and it was time for the 4th event of the Hawaii Winter Outlaw Series. The Maui Challenge 2 kicked off its first day with a day long freeride/ slide jam held on the most epic hill out there. 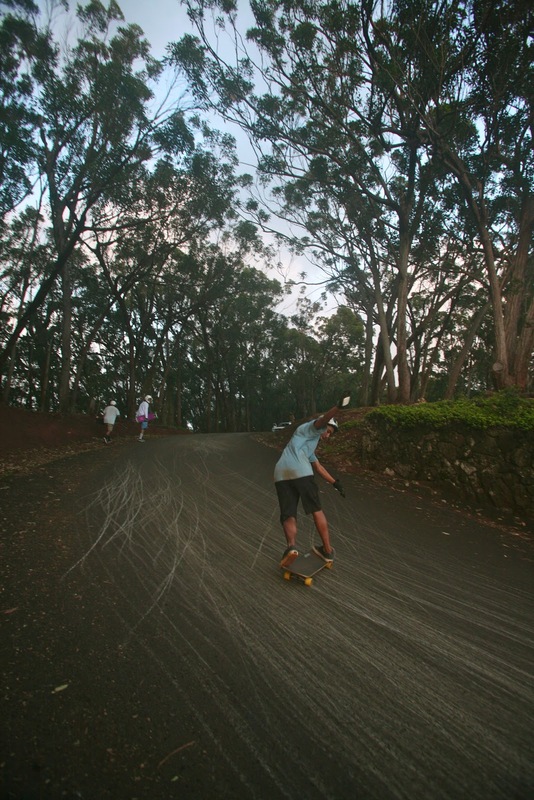 Skinny, butter smooth, black top… no straights, just bends, drops and hairpins… oh and it goes for MILES. 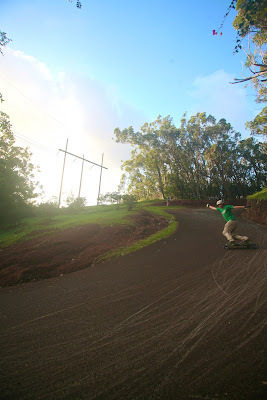 Since there are literally like 40+ turns that are sessionable for a slide jam, we just started at the top and worked our way down eliminating riders every time we would change turns. Normally judging our slide jams take a bit of time to judge cause everyone SHREDS… but this time we had Sector9/ SkateHouseMedia.com’s Matt K doin the judging. SO if he didn’t like it, you were out! Rider’s killed the first few turns for about an hour straight. 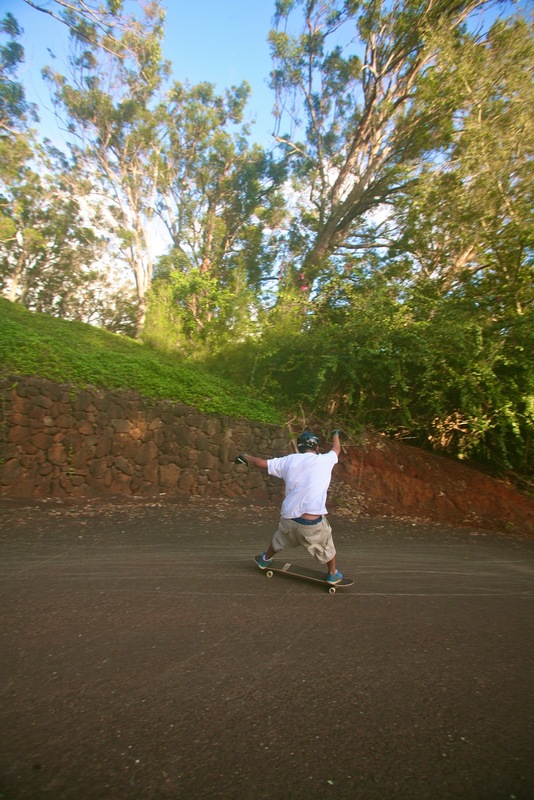 Big standies, ollies and early grabs, hands down race lines…. All kine styles were brought out for this jam. 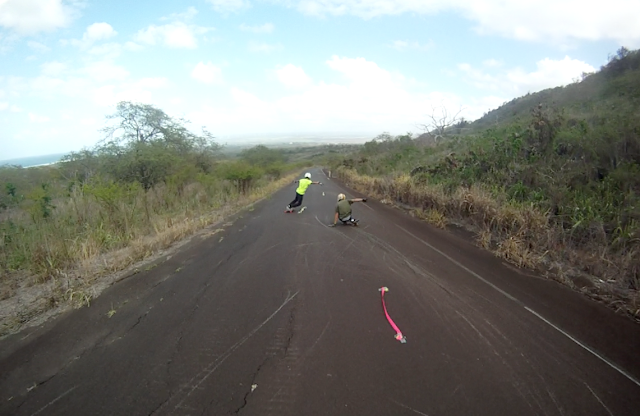 But now we were cutting the riders pool in half, leaving out top 16 riders to move onto the final turn. 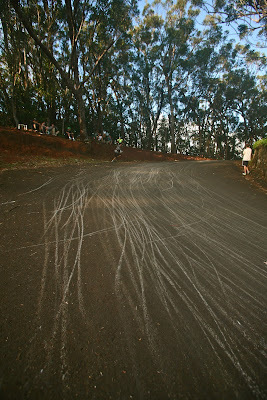 The last round was held on a left bend to dropping right hairpin, lots of options for different lines in this zone. 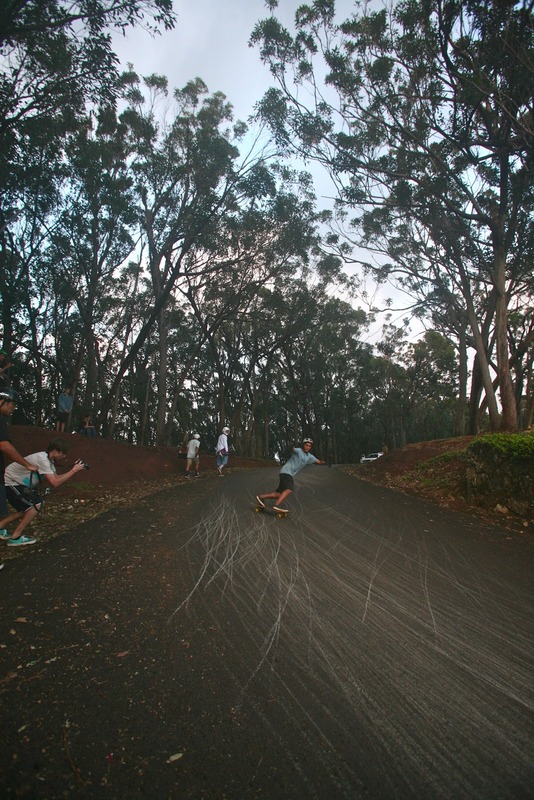 Through out the whole 30 minutes ish riders were given to sesh… every one of the top 16 went hard. And we still had skaters from all 3 islands in the jam, each crew bringing their own unique style. Once everyone was worked and wheels killed it was time for the awards. The Maui crew decided to give out ALL of the schwag for this slide jam, saving all the cash for the race the next day. So the top 10 got loaded with awesome gear thanks to our supportive sponsors! 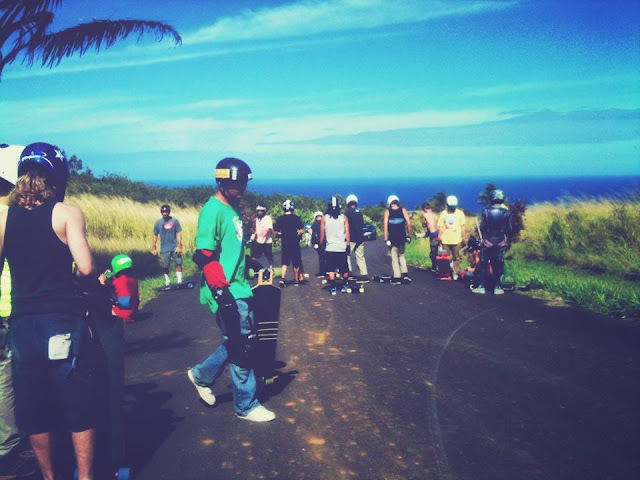 The top 5 riders( Dakota, Zach, Kaimana, Evan and KJ) walking away with completes… stoked. On Sunday riders all gathered early, race ready! Nearly 35 amped racers. We got the brackets set up and headed over to the race course. 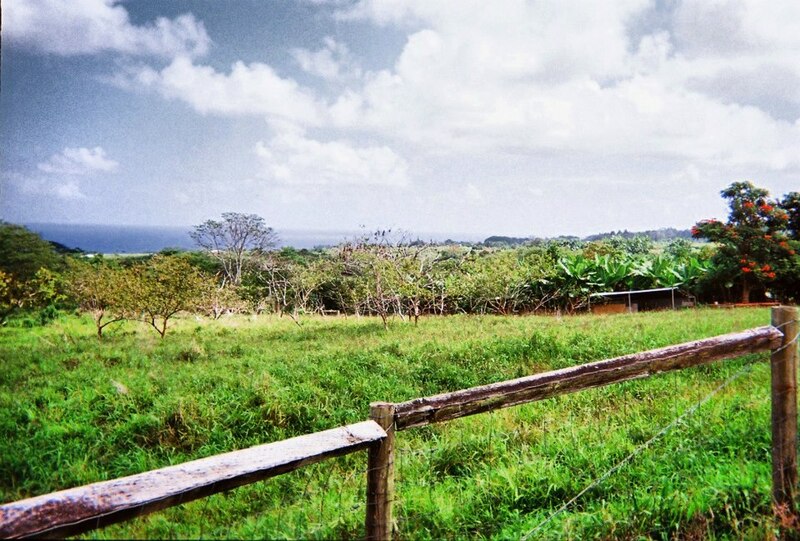 A housing development area with no built houses. Closed to cars. 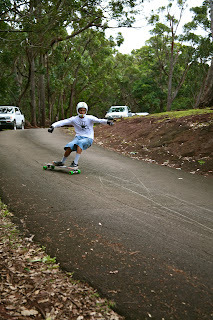 Fast sweepers at about 40mph with a tricky 90* left turn to the finish line. 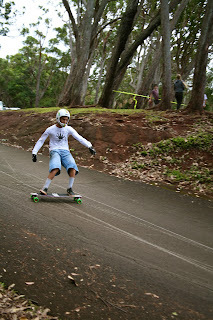 We took several practice runs and got real comfy with the course, then headed up the hill for the first round of the race. As we start up the hill, an agro unko (who is the property’s landscaper) suddenly blocks the road, ejects from his car and SNAPS at the whole crew of nearly 50 skaters and spectators… trying to fight any and everyone. The way he came at us he probably deserved to get a beatdown. But we stayed respectful, tried to talk to him… then left after he started punching windows, driving into trees and what not. Too much negative vibes. But that ain’t no thing for the Hawaii Winter Outlaw Series… we just changed courses to another epic zone. 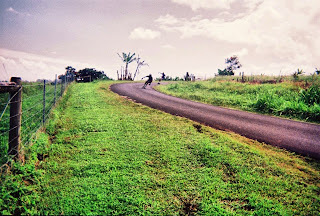 The new course was another grip and go road. 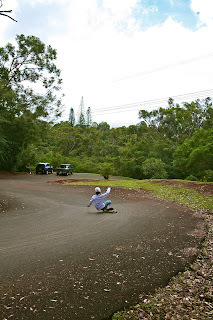 Constant bends, corners, ups and downs… pretty much a roller coaster, on freshly paved butter. No complaints there. Everyone was familiar with this course since we’ve been sashing the crap out of it the previous days, so we went straight to racing. The 4 man heats lined up at the start line which was in the middle of a little town… we even had some cheering locals as we’d push by. Racing was close and intense from the very start. The first section of this road that we are racing is nearly 5 miles long. 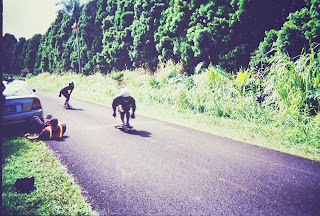 Getting in front and killing your legs the whole time wasn’t always the best call. 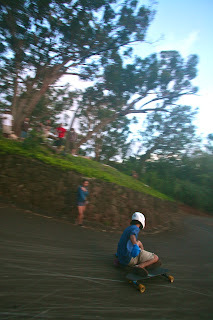 Once round one was complete, legs were hurting, adrenaline was high and we had our top 16 racers for the Maui Challenge. Everyone thought round 1 was tough… stacked is an understatement for round 2. And we have a good mix of racers from all across the U.S still in. Round 2 was set to race the second half of the road, which is a different course from round 1. 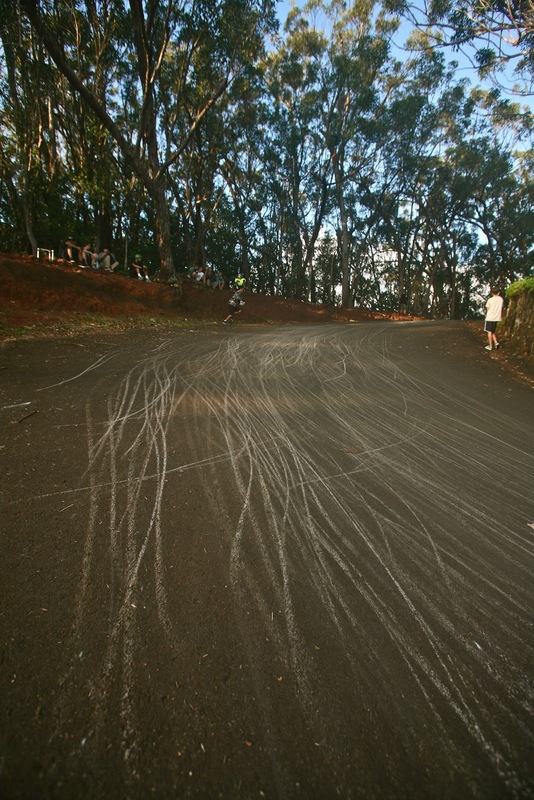 So it kept things interesting, racers couldn’t get too set with their lines on the hill. 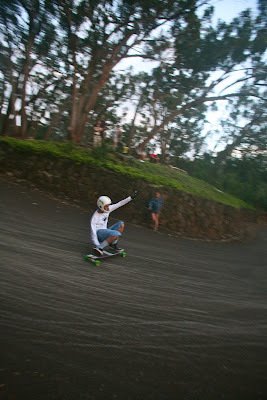 Again, 4 man heats lined up and started racing down the buttery curves. Sadly in my heat this round me and another racer connected in one of the first sharp corners of the course. Which resulted in me ejecting off a drop off and getting pretty damaged so didn’t get to see much racing… but everyone said it was another close round. And I believe them! Top 8 of the Maui Challenge. 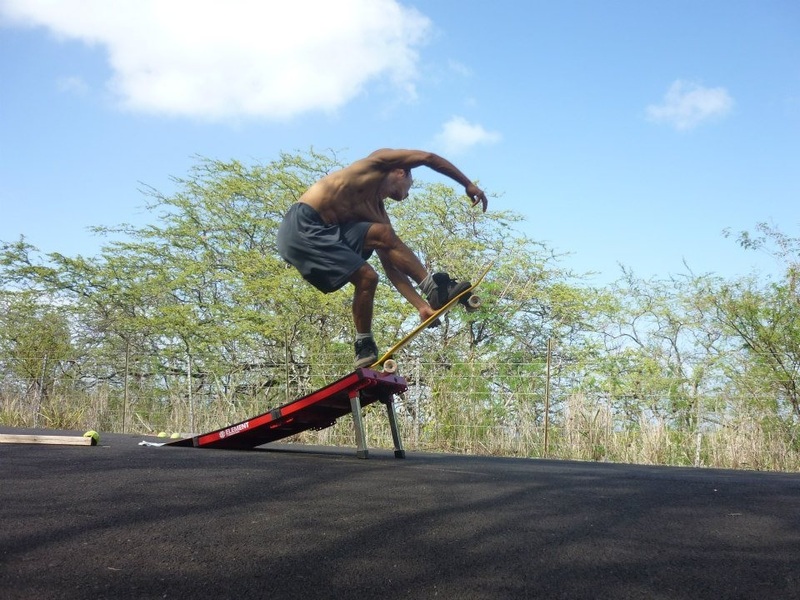 Nothing but shredders. Rhys, Dakota, Keola, Nikko, Maika, Michael, Dane and Jeff. Two heats of back to back passes. Tuck power and strategy was a big factor, and all of these semi finalist were ninjas at both! 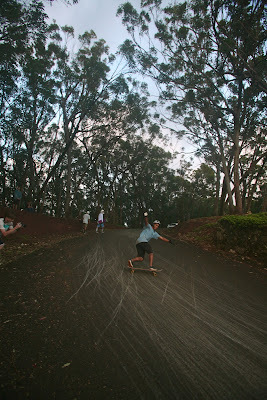 Coming out on top of the semis and moving onto The Maui Challenge finals was Jeff, Rhys, Dane and Keola. These finals is gonna be a leg burner! The two sections we have been racing were now combined to make one marathon race course which will take over 5 minutes to make it down… in your full tuck. The heat is off. 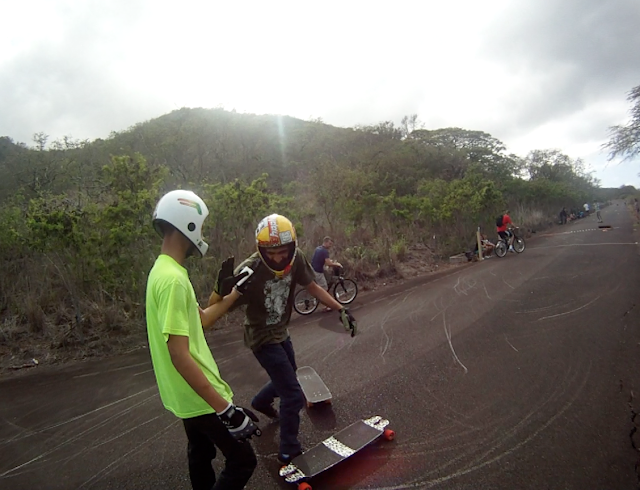 Throughout this whole heat there were constant passes from Jeff, Rhys and Dane. Which left Keola lurking in the back. The front three were going back and fourth, drag racing to get ahead in some of the straights. 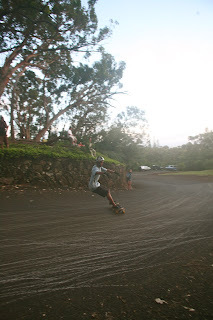 BUT as the racers came into the final 3 turn squiggle, KEOLA makes his move going from 4th to 1stwith in a couple turns, Crossing the finish line as the NEW MAUI CHALLENGE CHAMP. He kept the same racing method all day and it paid off. Following the race the top 8 were treated with light schwag and heavy CASH! Smiles all around. 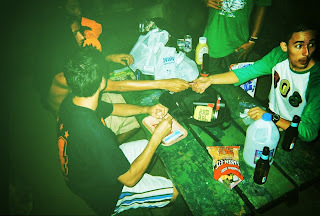 We spent some time reminiscing about how rad the trip was and started to pack up our gear since most of us were to leave that night. Another successful Hawaii Winter Outlaw Series event. 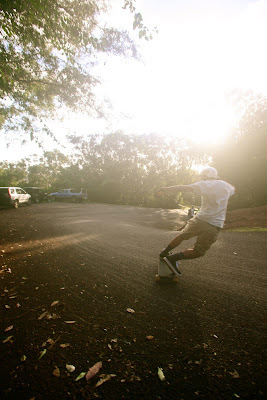 Big mahalo to Zach, Kaimana and the whole Maui crew for getting the event running smooth. Aslo a HUGE THANKS to all of the sponsors who helped. Our scene is growing bigger and better by the event. We greatly appreciate it. 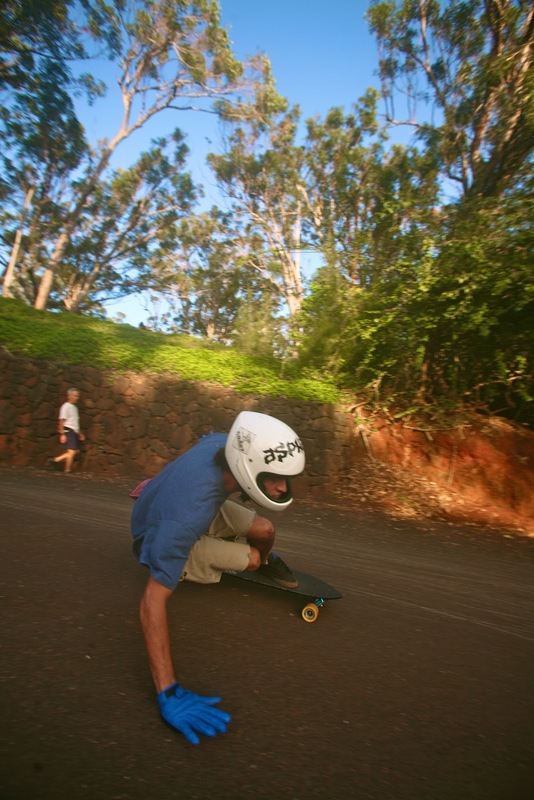 The next event will be Hawaiian Death Slalom which will be held on the North Shore of Oahu. 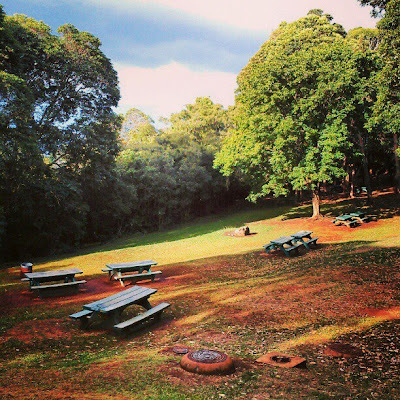 Be ready for an event like no other on the islands. 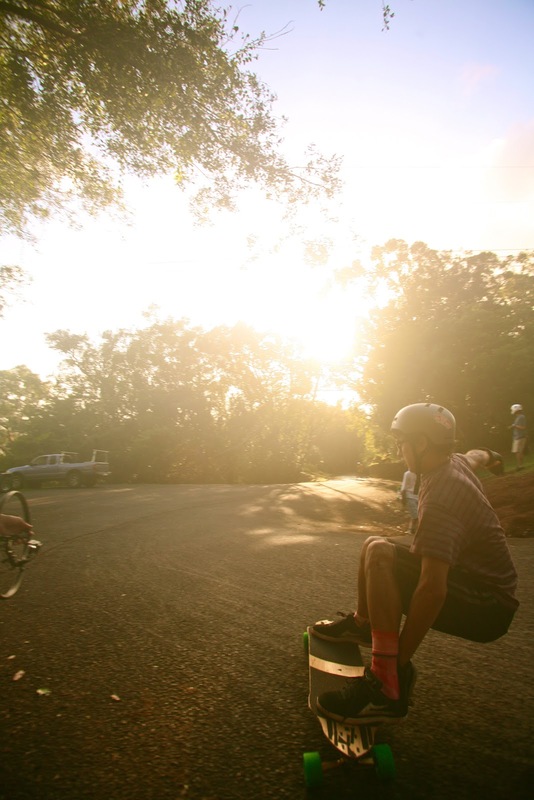 Just a little heads up… come with gear ready for slides, obstacles for ollies/ early grabs and ramps! See ya soon! 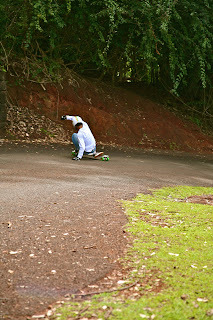 HawaiiWinterOutlawSeries F.O.S.A.L 5 Write Up and Photos. 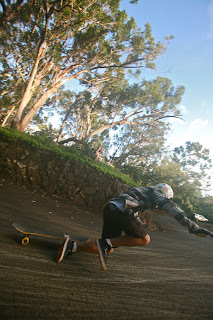 February is a bitter sweet month for us skaters here in Hawaii. 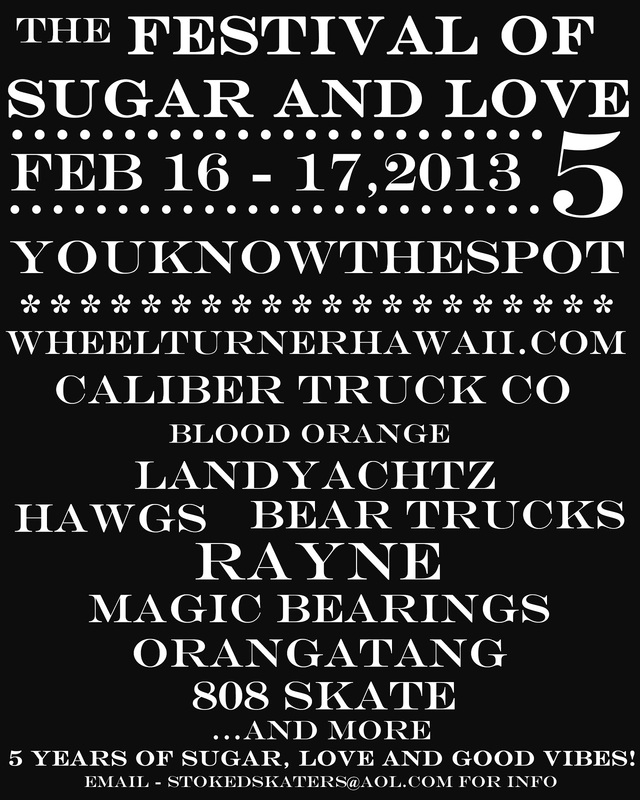 Sadly, its the last event of the Hawaii Winter Outlaw Series season... but The Festival of Sugar and Love is ALWAYS a good way to end it! 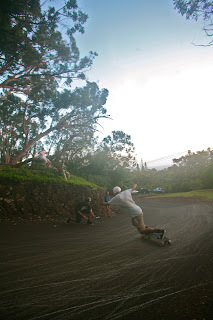 On Feb 16 & 17 wheel turners from all over the Hawaiian Islands gathered on Oahu for F.O.S.A.L 5, and hawt damnnn did they bring the heat! Once our zone was set for the night and the camp vibes were runnin strong.... we headed over to the ONE WAY DOWNHILL side of the park, which happens to be packed with hairpins.... got registration completed, and The Festival of Sugar and Love 5 was underway. Though we had less competitors this year then in the past, the skill level was higher then ever. First round was a 30 min Jam style sesh. 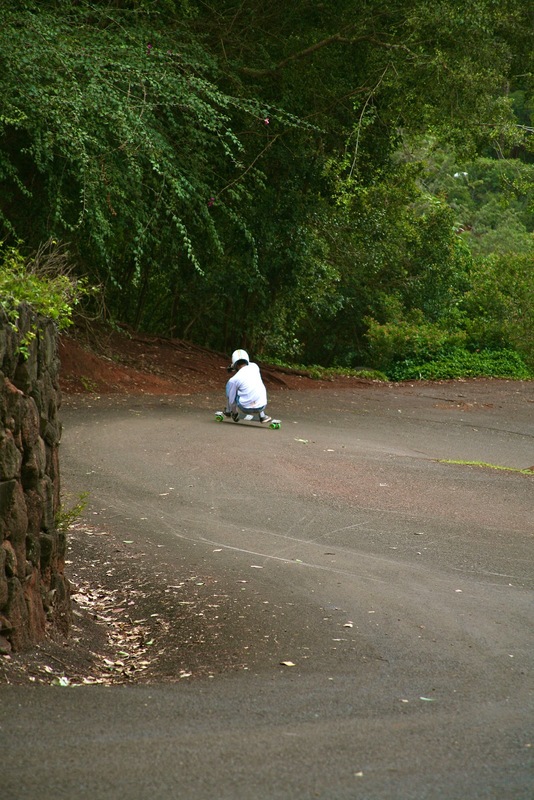 Riders could walk up and take as many, or as little runs as they wanted. Like every F.O.S.A.L we were overloaded with all kinds of different styles making it very difficult to judge. Luckily this year we had several very qualified judges to make the process a bit easier. 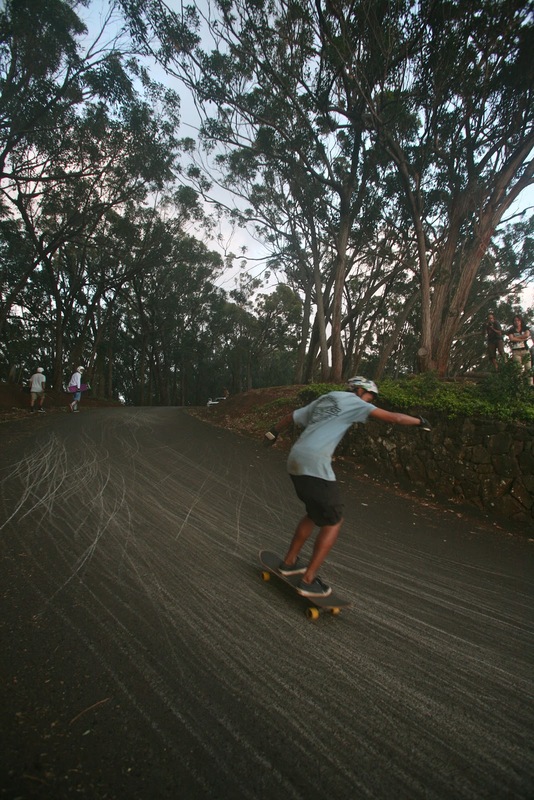 When the 30 minutes were up we had seen all kinds of SICK skateboarding on this steep S turn. Speed, technical tricks, switch runs, two hands down... all kine. 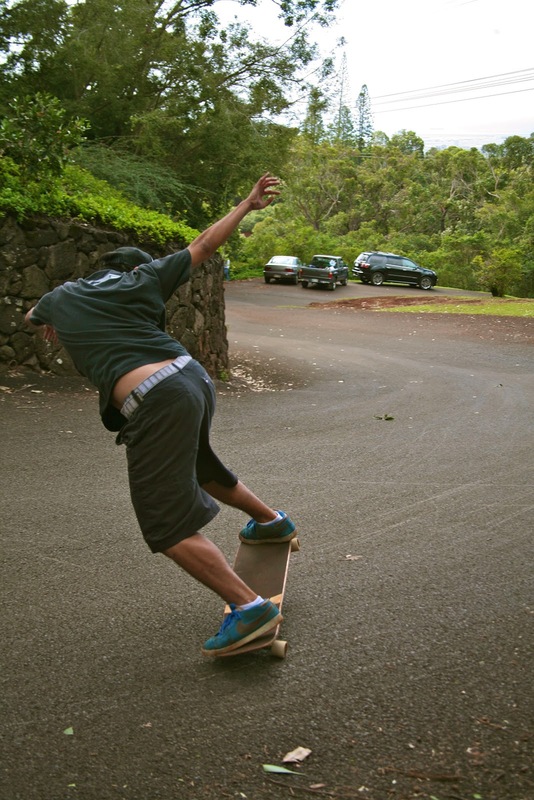 As much as EVERYONE in the first round was shredding... the judges were only able to choose their favorite 8 skaters. Moving onto the second round was Toa, Dakota, KJ, Bronson, Dante, Kaimana, Hunter and Nikko. This round got GOOD! 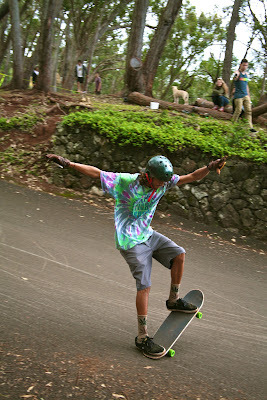 Theres still riders from several different islands, every skater having a totally different and unique style from the rest. 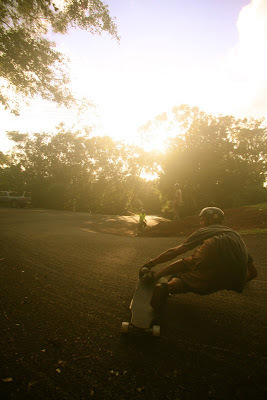 I love this about Hawaii skating! 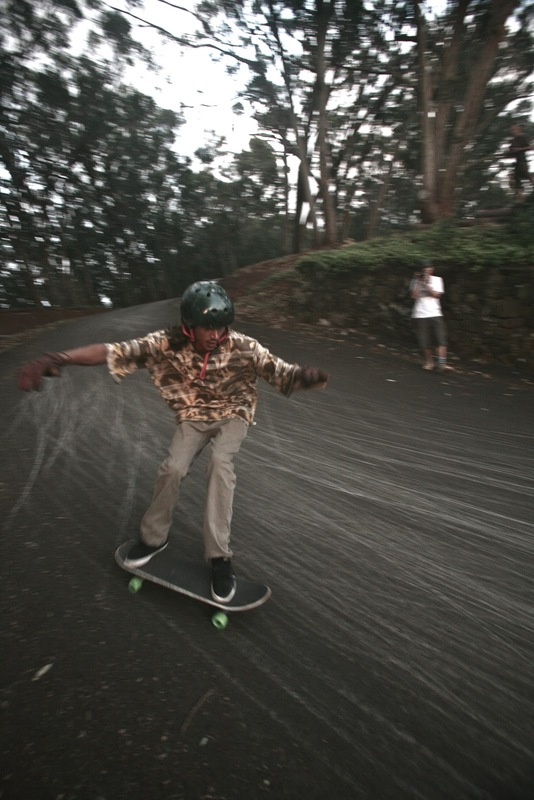 Styles are influenced by inner steeze, and not so much by what is seen on the net. Riders had the option to rest a while and wait to light up the turn after dark for a night sesh for round 2... but they were AMPING. So they decided to get underway despite the minor drizzle and setting sun. The judges had a HARD task now! 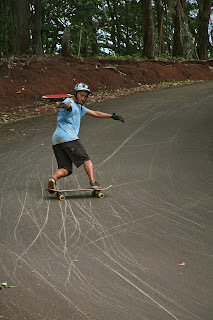 This round we are cutting out 8 riders down to 4, and everyone of them were going HARD. 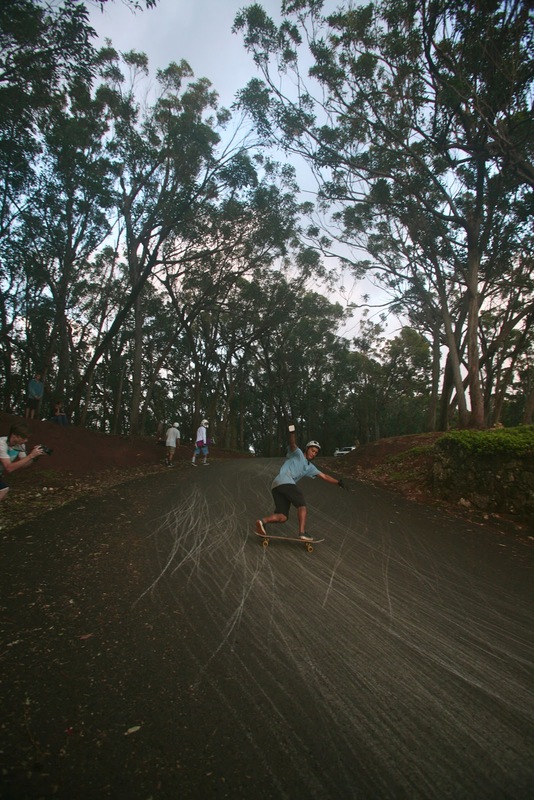 Nikko, Dakota and Dante kept their lines FAST. Nikko hands down, Dakota and Dante stand up style. 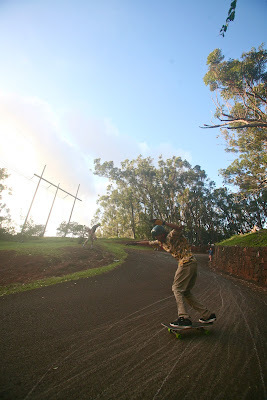 Kaimana and Hunter kept it standup for the most part, but both of them busted out the switch action quite a bit. 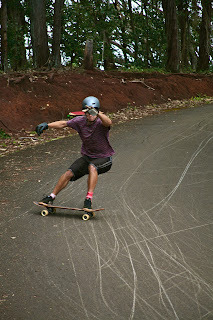 Toa and KJ went pretty tech... 360s in both directions, grabs, lifting noses and tails.... but they also switched it up a bit every few runs came with some faster lines as well. Bronson kept at his own approach, very tech slides at decent speed... but with street style ollie/flip tricks mixed in the run. 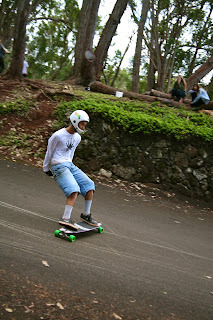 Every one of the 8 riders was very entertaining to watch, but only 4 riders would continue onto the Semi Finals. 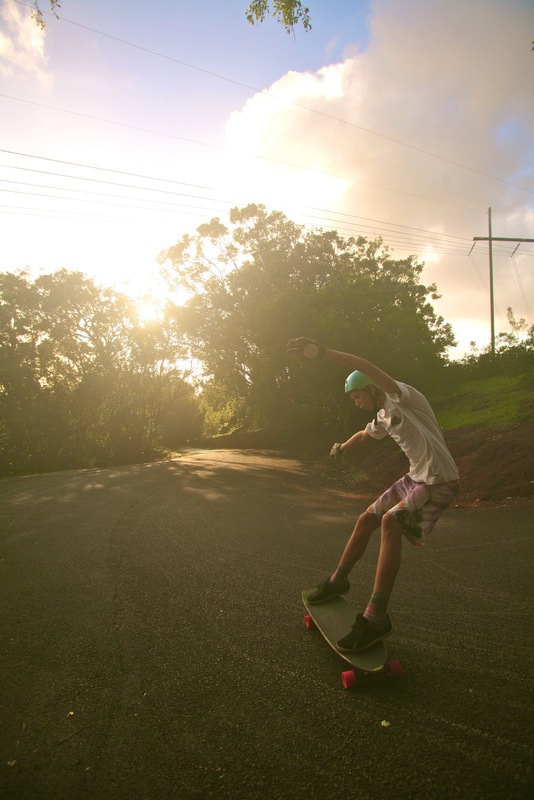 The sun is setting, round 2's half hour jam sesh is over... and after long discussion the judges have come up with F.O.S.A.L's top 4 riders. Toa Nanpei, KJ Nakanelua, Bronson Sterling and Dante Alston. 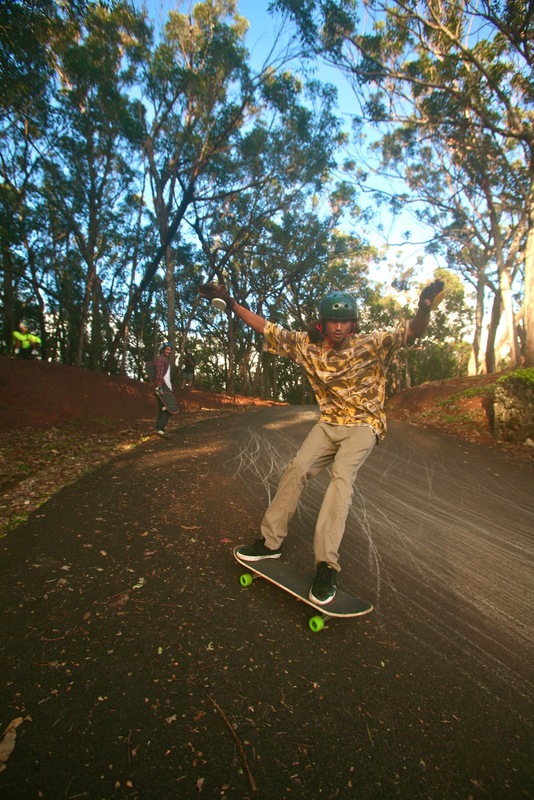 Everyone was beat from a day of shredding, so the final 4 decided to put off the semis till the next morning. 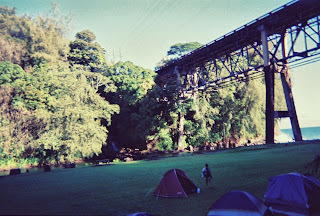 Everyone headed back over to our campsite...started up the BBQ, got some beers and sessioned into the night. And once again Cookie was the WINNER of the F.O.S.A.L party for the second year in a row. He even took home his empty bottle of jagermeister ( his first ever btw ) as a trophy. After a good nights rest... kinda... everyone woke up to a sunny, Sunday morning. A perfect day to finish off the H.W.O.S. Once everyone grinded some food and got some coffee... the semi finals were under way! This round would be a 20 min jam sesh, which gives riders just enough time to showcase everything they can do... while still trying to keep consistent through the session. We thought the last rounds were tough? This one is insane. 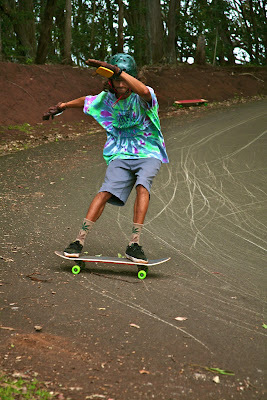 The judges really had to consider everything... speed, style, originality, consistency, number of tricks, look on the riders face, color of their socks, ect. When the 20 minutes were up the judges still couldn't seem to come up with a set two riders to advance, so they were forced to just do it by a vote amongst the judges. All judges voted Bronson Sterling into the finals but there were some split votes for the second person. When the votes were added up, it was Dante Alston to move on with B.Sterls to the finals! 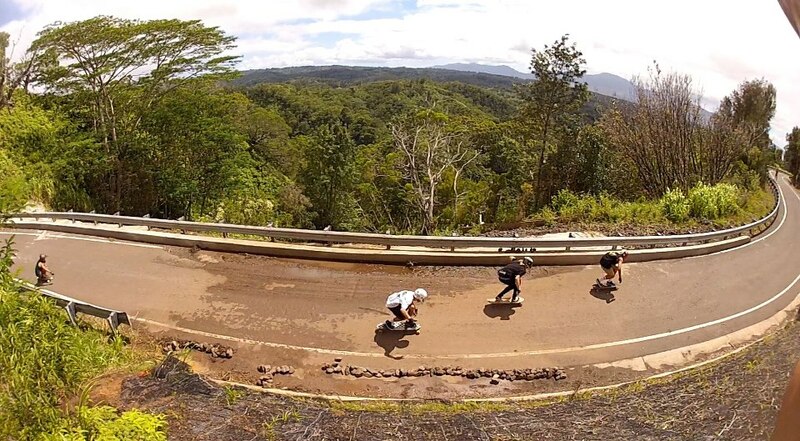 Two totally different styles and both riders SHRED HARD, this made for an epic F.O.S.A.L 5 Finals. This round is a little different then the rest. No freedom of having a jam sesh. 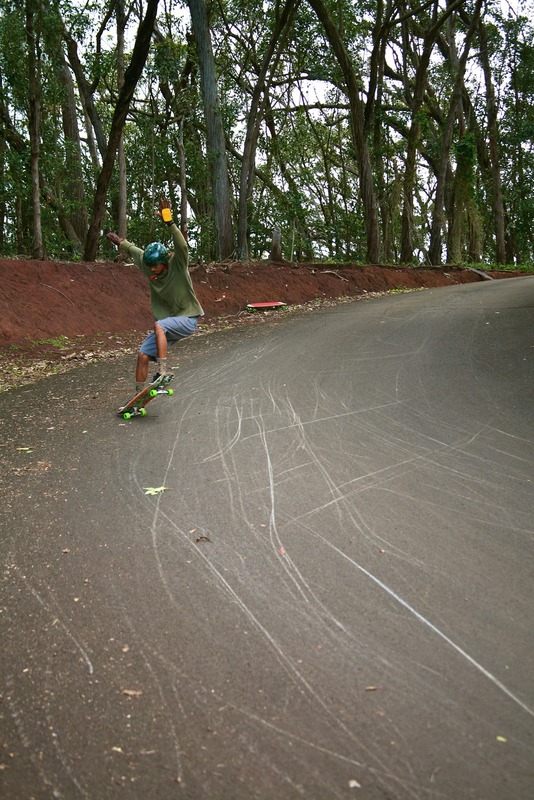 Each rider will get 3 solo runs to give it all they got. 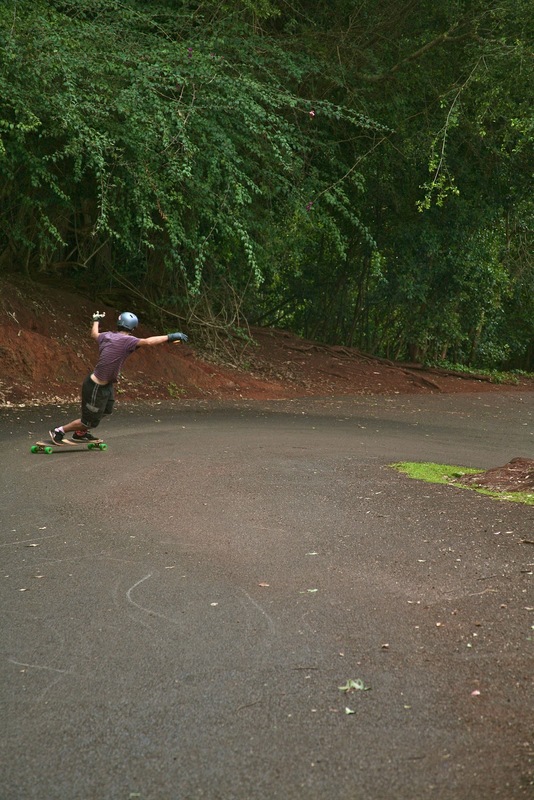 Following these 3 runs, they get 2 tandem runs with the other finalist. They lead one run, and follow one. Up first was Bronson. Through out his 3 runs he busted out more NBD loop trail lines then i have seen all year. He was blasting blunts constantly... some on wood only, no thane touching the ground! 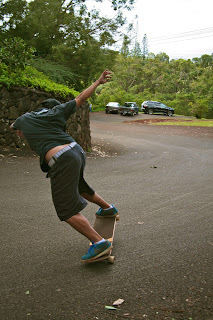 Then he'd follow up with something like a 180 out, then into a tre flip or fs flip. 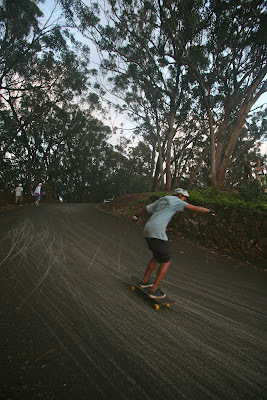 How about a no comply here n there, some mid turn full cabs, oh and how about just gap the bottom right turn for fun? 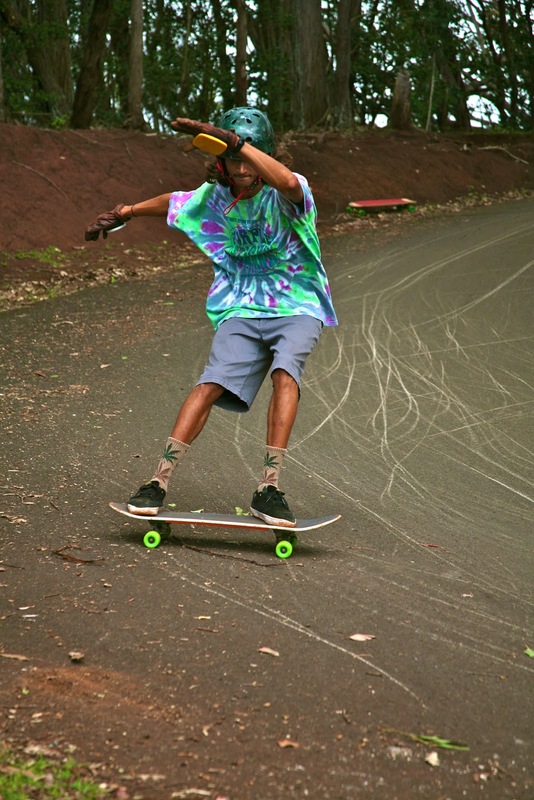 Gnarlyness. Next was Dante. 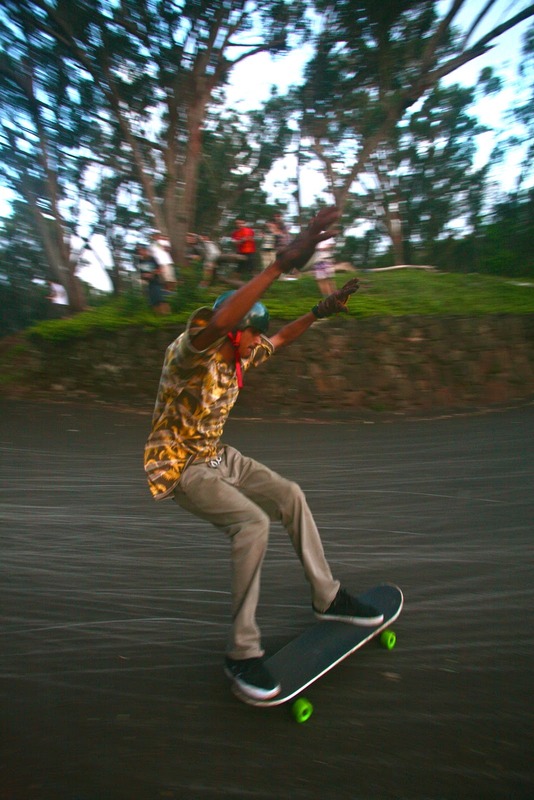 Speed with a touch of steeze was his approach. 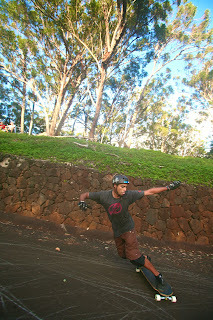 He was coming fast every run blasting a variation of squat slides in the first left , followed with big, clean switch slides in the right. Looking smooth and quick though out every run. 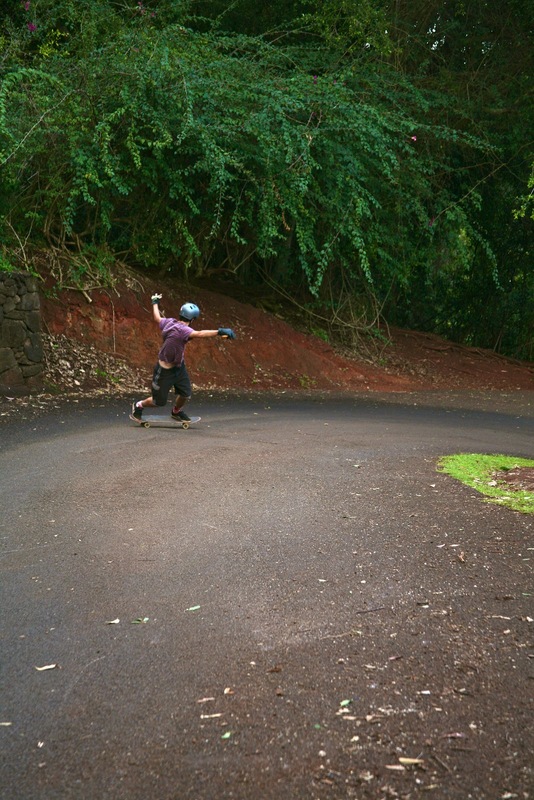 Now it was time for the tandem runs. Bronson leading the first run. B. Sterls kept a similar approach to the rest of his runs during the tandem. Kept it tech, while staying clean. 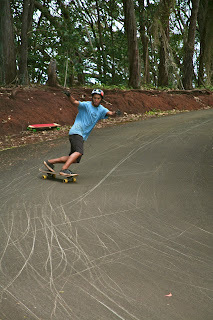 Dante followed a ways behind him with a stand up front side to backside. In the next tandem run Dante led. 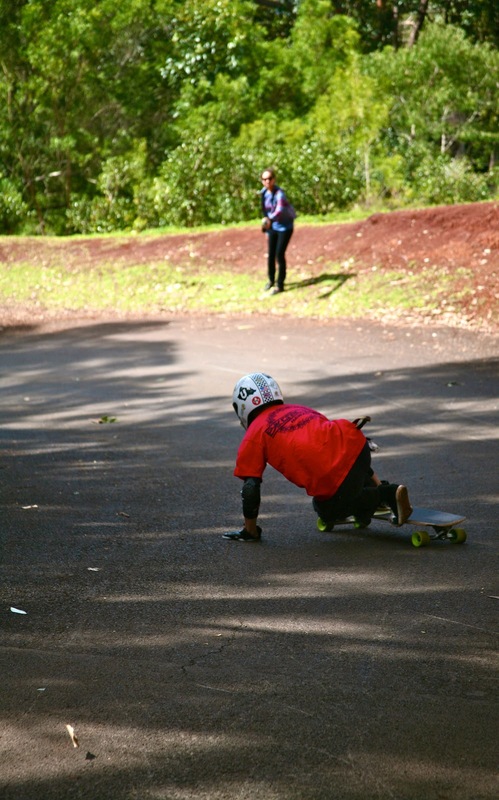 He chose to start from the top of the run to get a but more speed, so Bronson changed boards for the first time in the event to his speed board and went up to the top as well. When the two came into the turn Dante had a little gap on Bronson and threw a big frontside standie. Bronson followed with a hands down slide closing the gap a bit. Going into the right Dante had a little too much speed causing him to slide out a bit and loose his line. 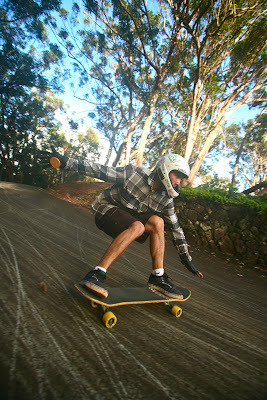 Bronson threw a hands down toe side, making the pass in the turn. BOOM. The finals were done. But we still needed to choose a winner and the judges tapped out. So it came down to a competitor vote. Each rider could only vote once. I made the announcement and counted the hands... and the winner was... GAHHH an equal split in votes?!? Being a past F.O.S.A.L finalist i know how beat n tired you are by the finals... so we didn't try to make them skate more. INSTEAD we had the most high stakes game of Jan Ken Po ( Rock, paper, scissors) ever! The best out of 3 game turned into a best out of 5. Even fate couldn't decide a winner! But in the end, the new Festival Of Sugar and Love 5 Champion is Bronson Sterling. Well deserved! An all around shredder... good job Bronson! Following the skating we gave out some SICK gear to the top F.O.S.A.L riders! Decks, trucks, bearings, wheels, gloves, pucks, shirts, socks... um everything you could need in life. Good Stuff! Then i realized i had a whole 2 more boxes of prizes! So we added up the OVERALL SERIES POINTS on the spot and finished up the season by awarding our overall winners. The top 16 in the series were also stoked to take home a load of gear/life essentials. Nothing but smiles to finish off the Hawaii Winter Outlaw Series. 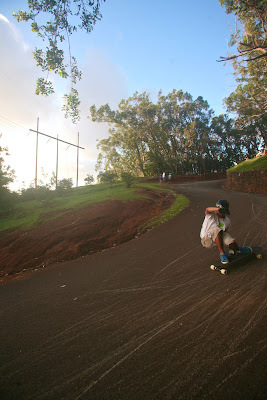 Us here at WheelTurnerHawaii.com along with all of the wheel turners on the islands would like to give a HUGE Mahalo to all of the supporters who could make this season possible. We wouldn't have a series without you! 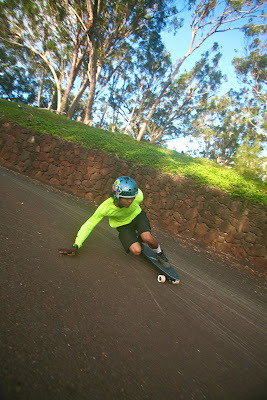 I hope everyone had a great Hawaii Winter Outlaw Series race season. 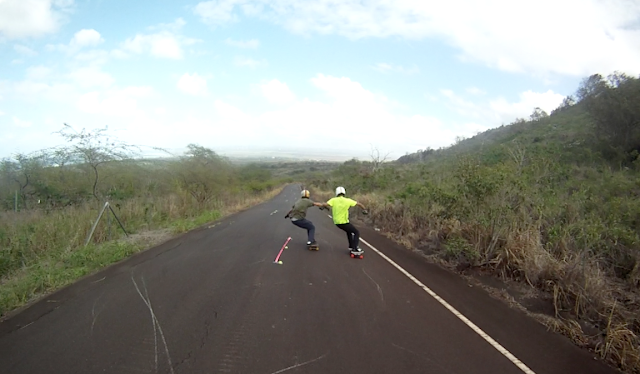 We stayed safe, while shredding the island chain to pieces. 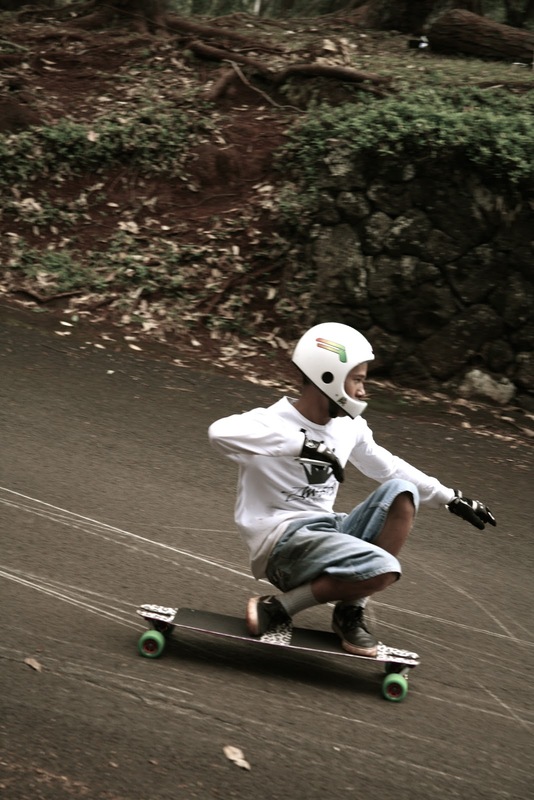 The progression of the sport here in Hawaii is growing more n more every year and its not stopping! 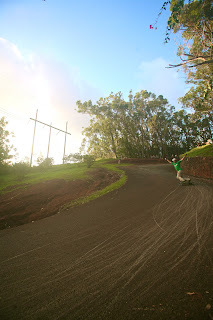 Until next season, everyone shred hard and ride safe. 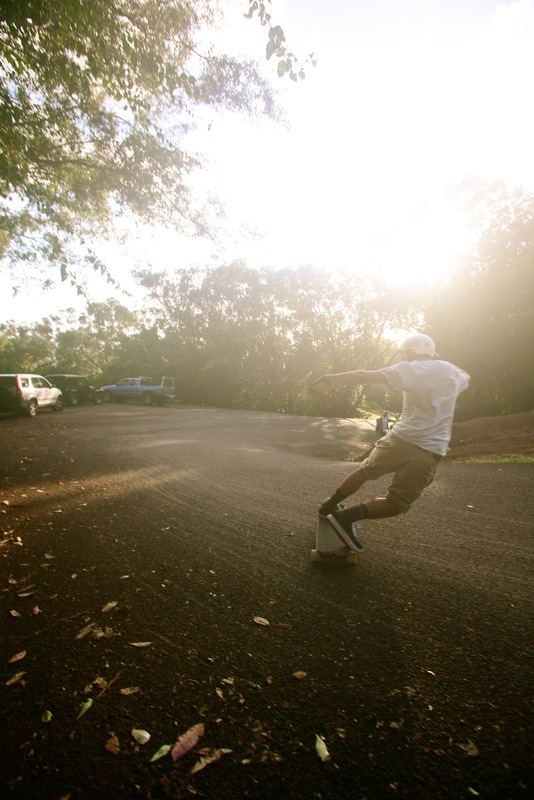 Spread positivity through turning wheels. 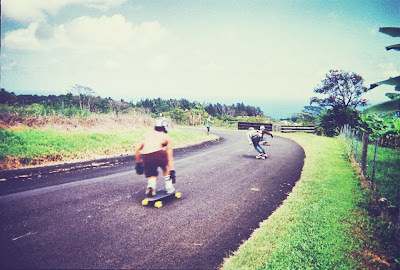 5 years of WheelTurnerHawaii.com events and many more to come! The Festival Of Sugar and Love 5 Results. and the rest of the AWESOME supporters. Please give photo credit if copied. This is a great fest! 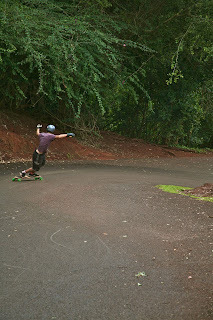 My girlfriend bought a longboard here https://x3mboardshop.com/longboards/trucks/ and soon she will take part in the competition. 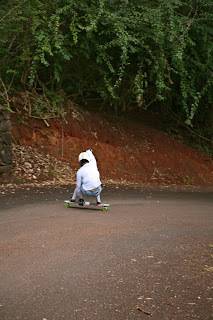 She goes very well and I like her passion moreover, it is really cool!